Moalboal is a small village on the island of Cebu in the Philippines with a rapidly developing dive destination. You can hardly find random tourists here – Moalboal is popular among snorkeling and diving lovers, because there is an incredibly beautiful coral reef with rich marine life right near the shore in the south-west of the island of Cebu. After Busuanga and Palawan island we arrived in Moalboal on the island of Cebu to change the type of our vacation in the Philippines. 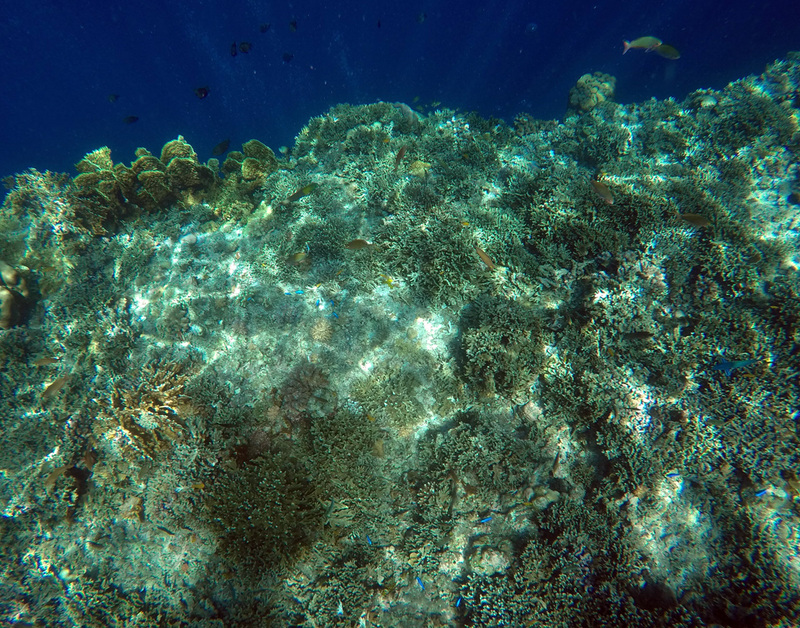 After boat tours along the lagoons and white beaches of Coron and El Nido, we decided to spend a few days snorkeling at the coral reef of Moalboal. The structure of the coral reef along the Moalboal shoreline makes it an ideal dive site in the Philippines, you can also go in for freediving and snorkeling. The reef is right at the shore, and in some places it goes to a depth of more than 40 meters. 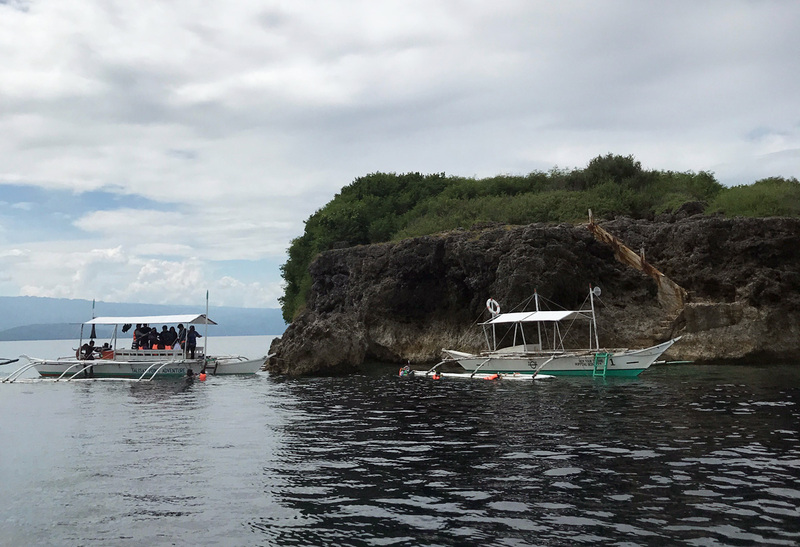 And 3 km from the coast there is Pescador island – another popular place for diving and snorkeling in the Philippines, a feature of which is an underwater cave. 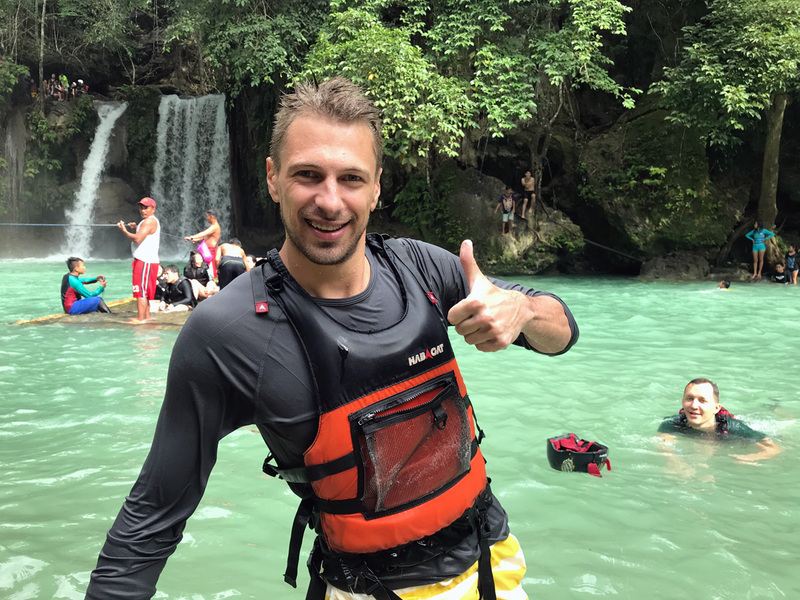 Another reason to go to Moalboal, Philippines was that it is convenient to get to the Kawasan waterfall from here, and we planned to spend a day behind canyoneering on Kawasan waterfall. 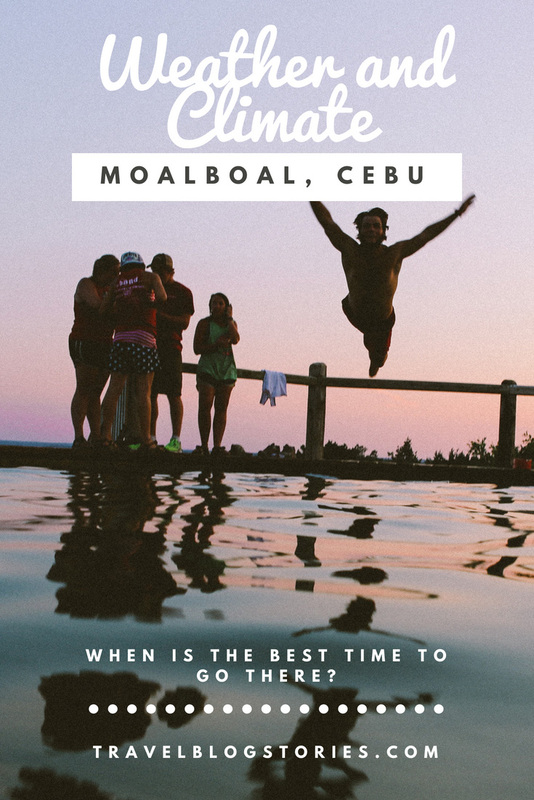  The weather and climate in Moalboal, Cebu — When is the best time to go there? 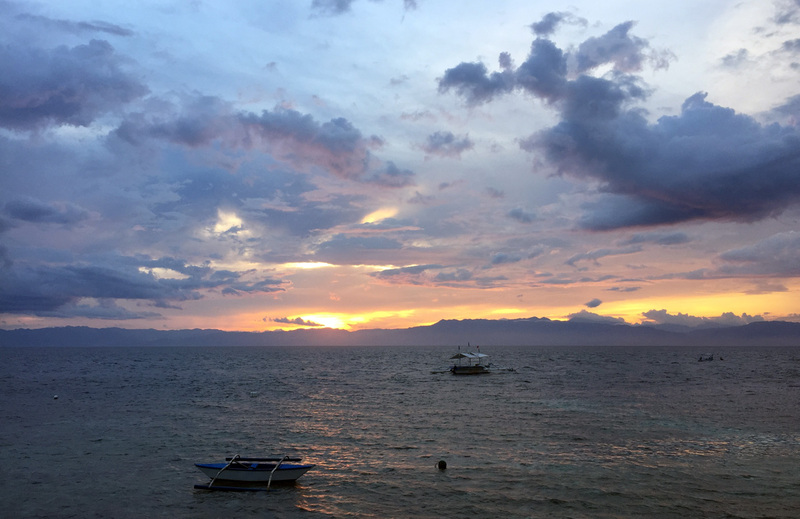 The weather and climate in Moalboal, Cebu — When is the best time to go there? 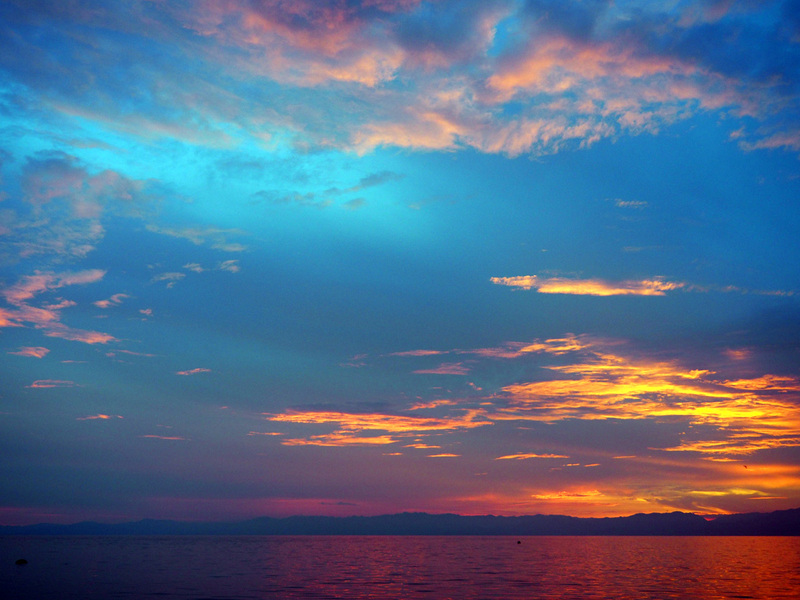 The climate on Cebu island classically for the Philippines is divided into 2 seasons – wet and dry. 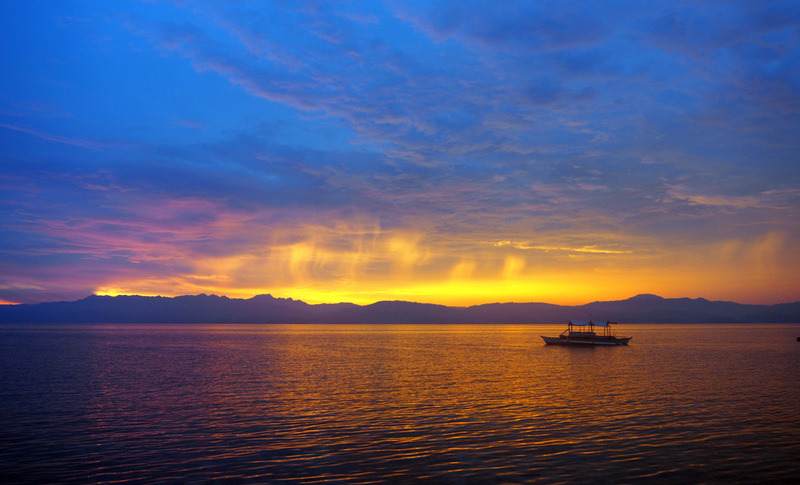 The wet, rainy season on Cebu island usually lasts from June to October, while the rainiest months in Moalboal are July and September. During these months vacation in Moalboal, Cebu can really be spoiled by the weather, since the chance of long heavy rains, typical of the Philippines. The dry season in Cebu, Philippines lasts from November to May, the least precipitation according to statistics falls in February, April and May. The most windy weather on Cebu island and in Moalboal is in January and February. And the hottest and sunny months in Moalboal are April and May. 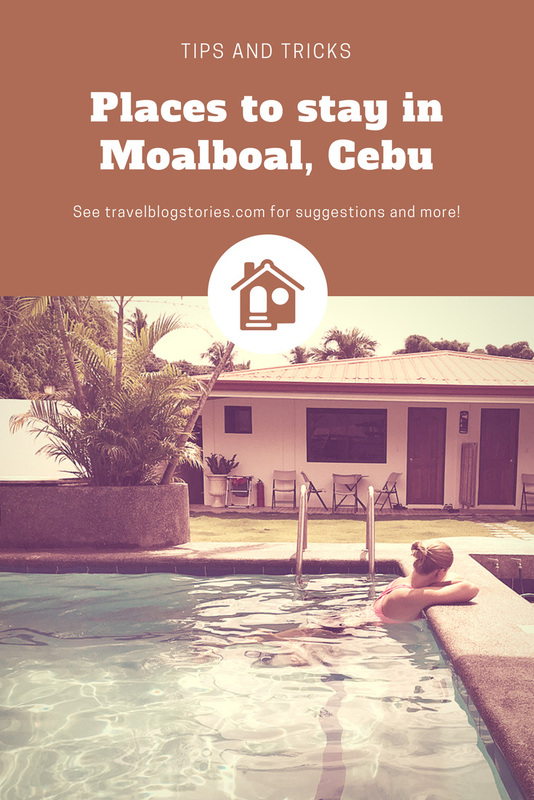 We stayed in Moalboal on Cebu island in October, the weather did not upset us: the days were sunny, while in the evenings there were short but heavy rains. There is Mactan Cebu International Airport in the capital of the Philippine island of Cebu, which, in addition to domestic flights around the Philippines, for example from Cebu to Boracay, serves international flights. It’s comfortable for travelers from other countries – you may not fly through the capital of the Philippines – Manila. And if you plan to visit Cebu island from Manila – take advantage of a direct comfortable flight with the help of air tickets from such companies as Cebu Pacific , Air Asia or Philippine Airlines. By the way, we liked flying with Cebu Pacific most of all, moreover they have a convenient website and a mobile app. 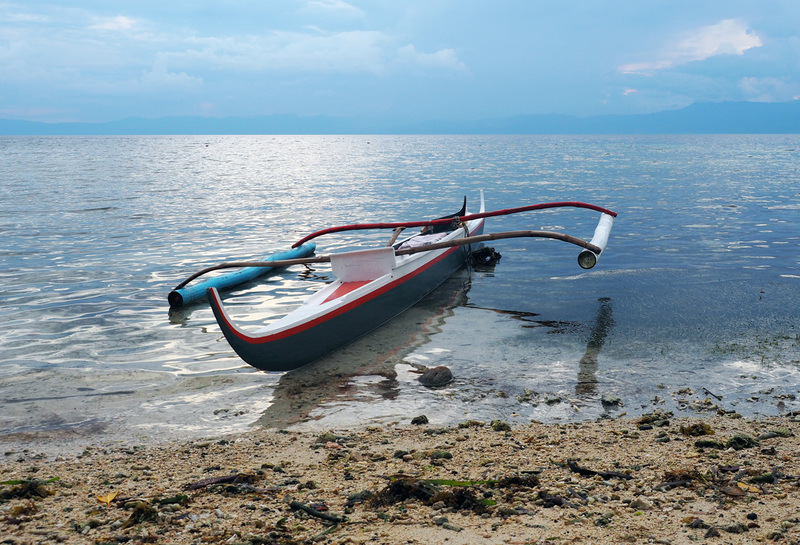 The itinerary of our trip to the Philippines was based on direct flights and convenient travel between the islands. To get to Moalboal we took a flight from Palawan island to Cebu island. To be more precise, we flew to the neighboring island of Mactan in Lapu Lapu, where Cebu International Airport is located. Our plane landed at about 11pm, and so as not to stop in Cebu City for the night, losing another half a day on the road, we decided to go to Moalboal by first bus at 4 am. 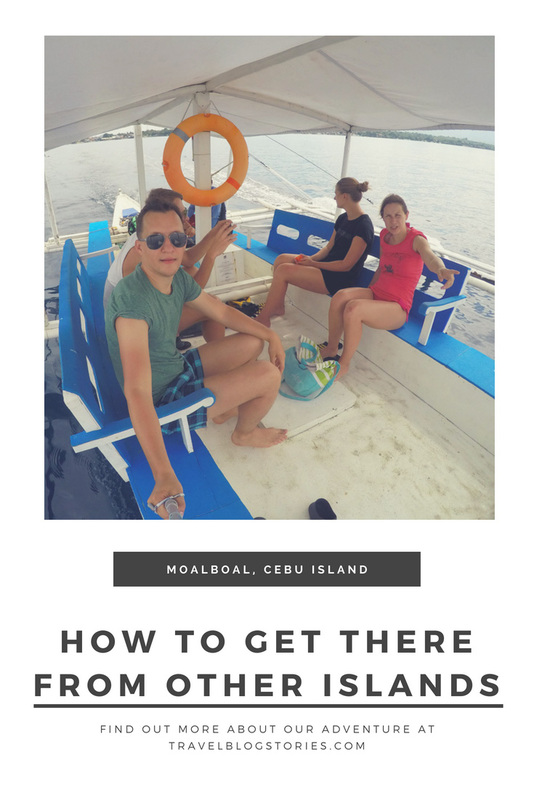 You can also get from Cebu Airport to Moalboal by taxi — approximate cost is 2000 PHP ($ 40) +/- 200 PHP, if the driver asks for a price much higher – better look for another taxi driver. Buses depart from the South Bus Station of Cebu City (the capital of Cebu island), you can find the schedule Here. We used Uber from the airport to the South Bus Station of Cebu City, the trip cost only 270 PHP ($ 5,5), at night the road through Cebu City took us about 15 minutes. To get to Moalboal from Cebu City you need a bus “Cebu — Bato via Barili”. Tickets are bought on the bus at the conductor, like everywhere in the Philippines. There always are vacant seats except for 5-6 pm, when there are so many people traveling from the South Bus Station of Cebu City, that it’s not the most successful idea. We went by air-conditioned bus, it was cold inside, but certainly better than without air conditioning. I advise you to have on your trip a warm hoodie, just for such kind of travel. It is usually cold inside the buses in the Philippines and you can easily fall ill. The bus makes several stops in Moalboal. We left the bus near McDonald’s, suggesting that unlikely something else will be opened so early in the morning. Central street in the tourist area of Moalboal goes along Panagsama beach. 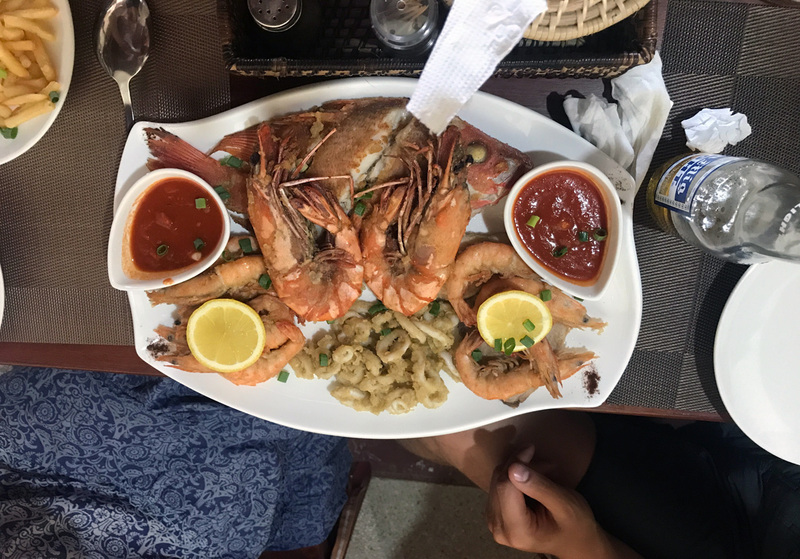 There all the restaurants, souvenir shops, diving schools, shops with snorkelling equipment and island hopping/excursions sales in Moalboal are concentrated. Our hotel Parrot Resort was in the tourist area, so after a morning coffee in McDonald’s, we caught a tricycle and went to the hotel. To Moalboal from Bohol Island, Philippines: on a ferry from Tubigon or Tagbilaran (better from here, more boats) to Cebu Island, then by bus from the South Bus Station of Cebu City, as I described above. 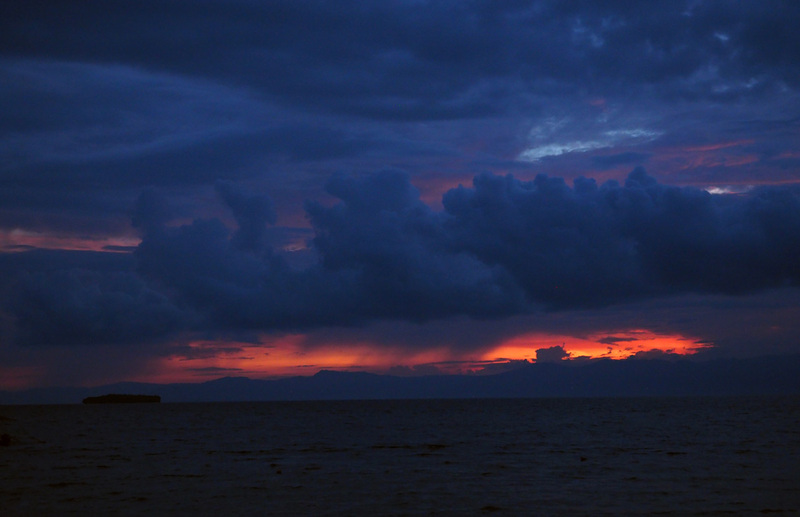 To Moalboal from Negros Island, Philippines: from Dumaguete – on a tricycle to Sibulan, then by ferry from Sibulan (Negros Island) to Liloan (Cebu Island), it’s only about 15 minutes on the way. In Liloan it is necessary to take a tricycle for 5 km to Bato, and then from Bato 2.5 hours by bus to Moalboal. The bus is Bato – Cebu City bus via Barili, passing through Moalboal, so do not miss your stop. Moalboal is a very popular, fast-growing diving resort on Cebu island in the Philippines. 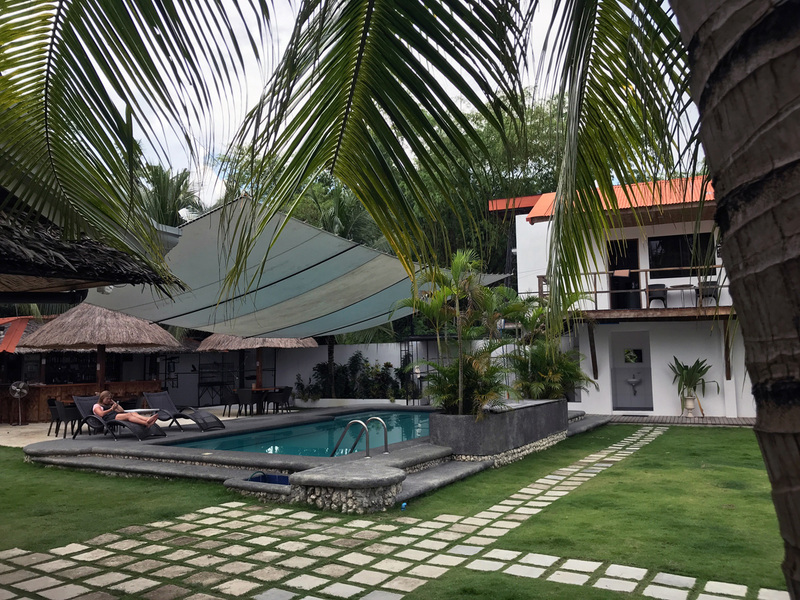 There is a high demand for vacation rentals, so especially in high season, it’s better to book good accommodation should in advance (It doesn’t matter whether it’s a guesthouse, apartments, hostel, house for rent or a beach resort in Moalboal, and it doesn’t matter whether you book on Airbnb, Agoda or Booking). There is no wide choice of hotels in Moalboal near White Beach, mostly there are good hotels with own restaurant and bar. Hotels in this area are at a decent distance from each other, and if you decide to stay in Moalboal, Philippines near White Beach – most likely you will spend most of the time in the hotel, as there is no central street with cafes and shops where you can walk. For this purpose it is necessary to take a tricycle and go to Panagsama beach. To stay in Moalboal we chose a hotel near Panagsama beach, because in our opinion it is more convenient to live in this area — there are a lot of cafes, shops and dive shops which offer equipment and sell island hopping tours nearby, while near White Beach there are not. Most of all the accommodation for tourists for all tastes in Moalboal, Philippines is concentrated near Panagsama beach — from cheap hostels and guesthouses to expensive luxury hotels and beach resorts with a wide range of services and different room rates. You can always rent a tricycle to go from Panagsama beach to White Beach. But Panagsama beach has its own disadvantages, namely, it is not intended to lie down, sunbathe and relax, here you can only go into the water and snorkel or dive. White Beach is good as well for sunbathing and snorkeling or diving. More details about snorkeling and diving in Moalboal, Philippines you can read Here. For our company for 5 days in Moalboal we chose to stay at Parrot Resort. A small cozy hotel in Moalboal just for 8 rooms. The cost of staying during our trip was 3250 PHP ($65) per night for a double room. The owner is Swiss, the hotel is always clean, there’s a well-groomed area with a pool and its own small bar. For extra money — 250 PHP ($5) per person a day you can order a breakfast, quite good for the Philippines. Breakfast at the hotel we liked more than breakfast in The French Coffee Shop cafe. 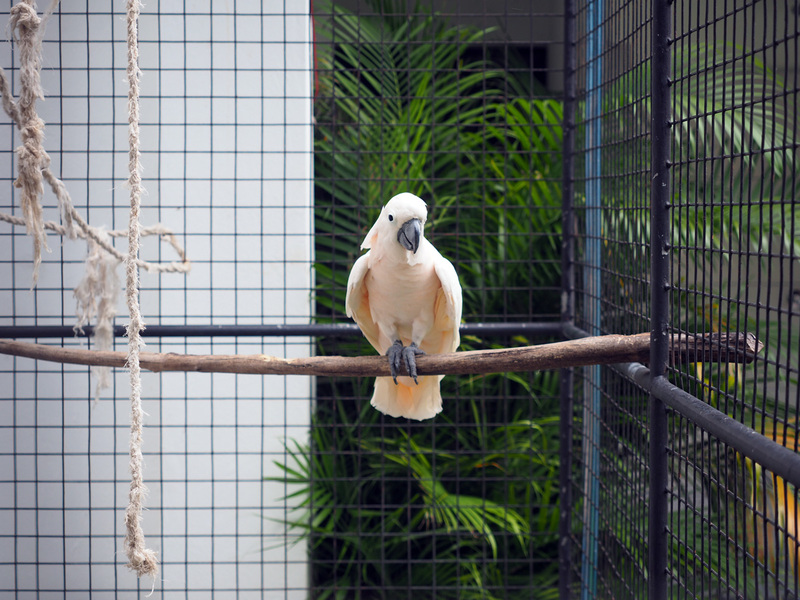 A distinctive feature of the hotel is that parrots live there, you can come into the cells to feed the birds. There is also a very kind doberman. In the mornings because of the parrots it may be a little noisy, but those who come to Moalboal to dive and snorkel, get up early, so this is not a problem. The hotel staff is very responsive and responded to all our requests. The rooms are spacious, each room has its own veranda with a table and chairs where it’s nice to spend evenings. 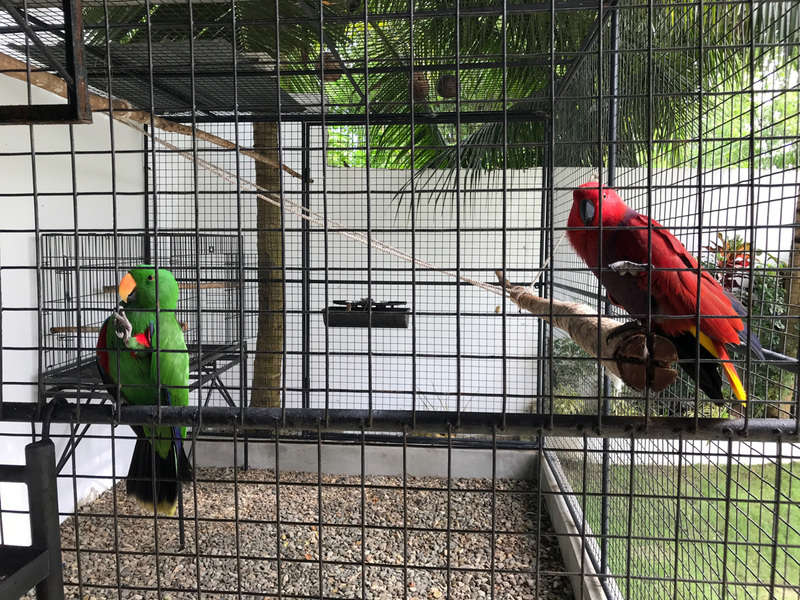 We really enjoyed the time spent at Parrot Resort and we can safely recommend this hotel for a stop in Moalboal, Philippines. In general, in the area of Panagsama beach in Moalboal there are vacation rentals for different tastes, ranging from cheap hostels for backpackers and ending with luxury hotels that are better booked in advance. 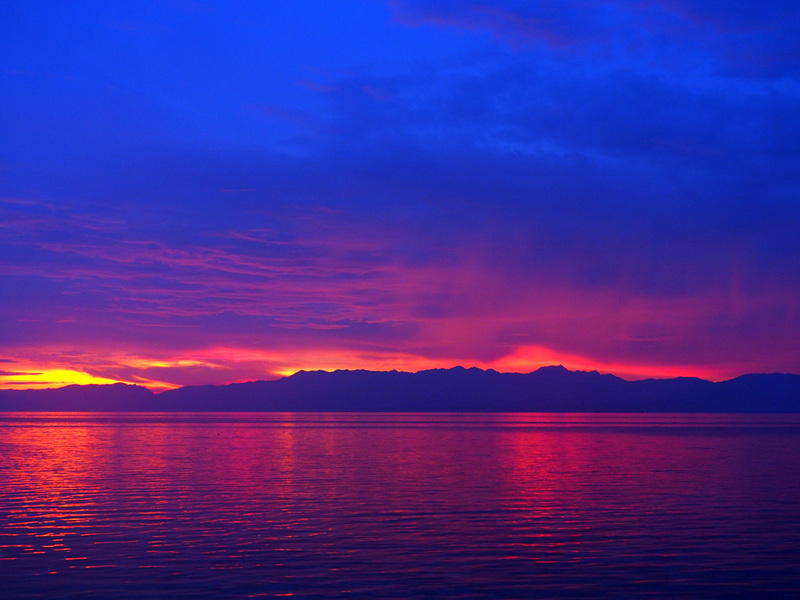 From 10$ per night – Moalboal Backpacker Lodge, with rating of 8,4 points. The most popular hostel in Moalboal, which is located near Panagsama beach. Moalboal Backpacker Lodge offers both rooms for 1 or 2 and common rooms for 4 and 14 people, in which you can rent a bed. From 15$ per night – Hotel Sisters Inn, with rating of 7,2 points. Another variant of budget staying in the area of Panagsama beach. 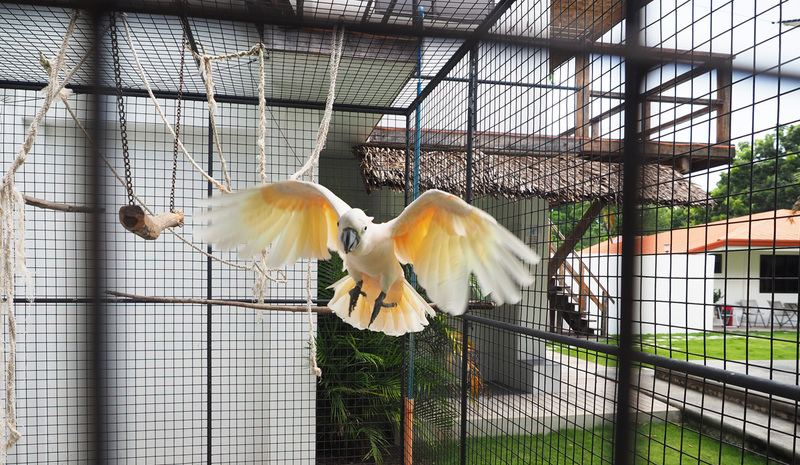 From 30$ per night – Moalboal T Breeze Coastal Resort, with rating of 7,9 points. One of the medium hotels on White Beach. 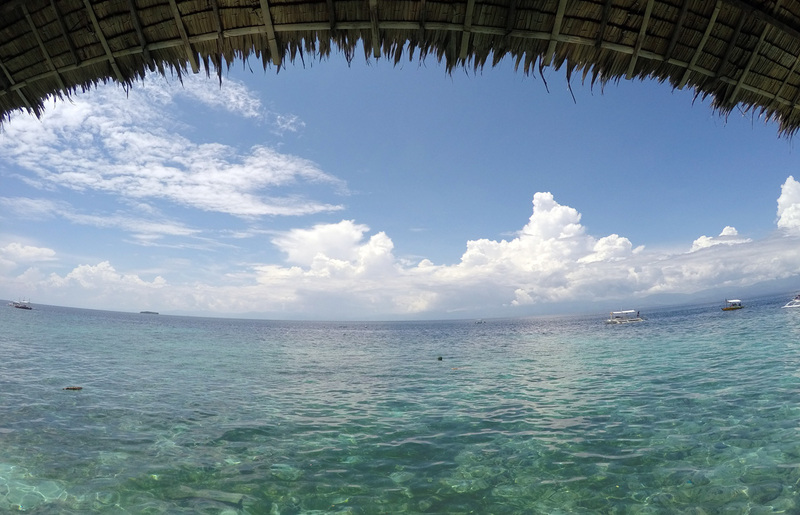 The advantage of Moalboal T Breeze Coastal Resort is a coral reef nearby where you can snorkel whenever you want. From 45$ per night – Oceanfront Paradise Resort, with rating of 9,0 points. A good accommodation to stay right on Panagsama beach, the hotel has a sea view. From 47$ per night – Asian Belgian Dive Resort, with rating of 7,8 points. This dive resort is an ideal place for divers to stay in Moalboal, Philippines: the location is between White Beach and Panagsama Beach – a very cozy, secluded place. From 52$ per night – Quo Vadis Dive Resort, with rating of 7,8 points. Hotel with a dive center on Panagsama beach. 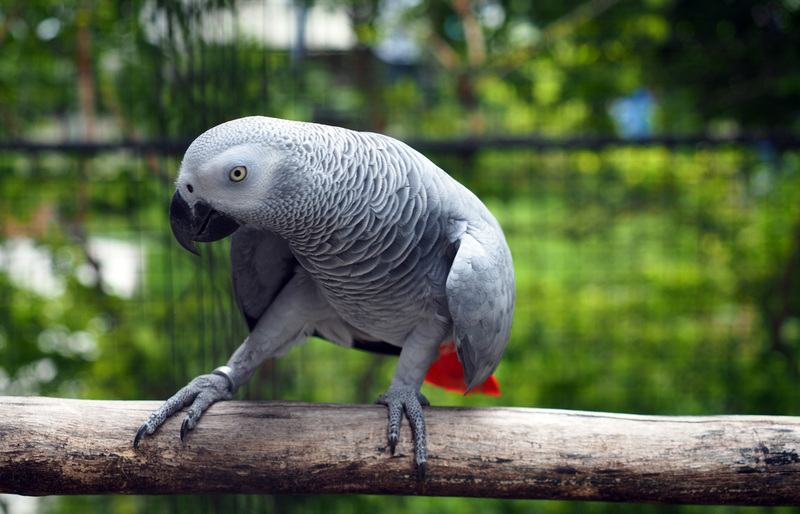 From 55$ per night – Parrot Resort Moalboal, with rating of 9,1 points. 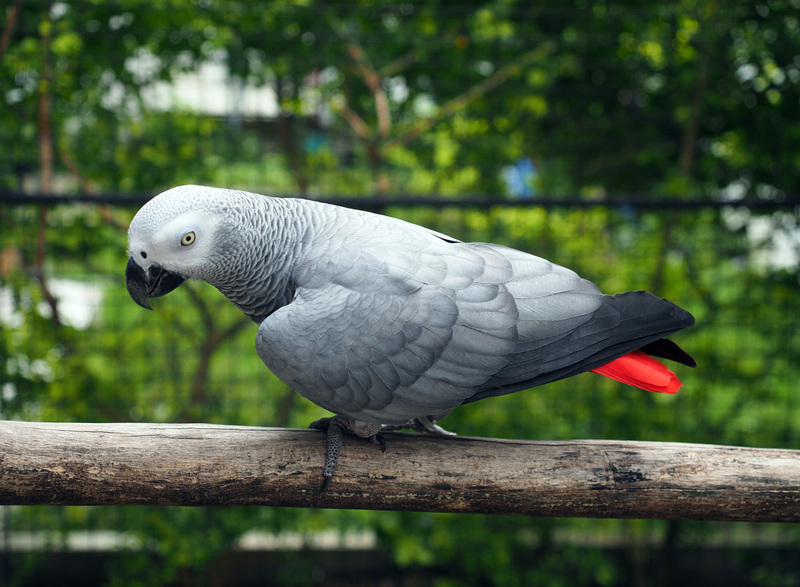 A hotel with interesting idea — parrots live there, you can visit and feed the birds. We stayed in this hotel, there were no disadvantages, we had only positive emotions from staying. A detailed review of this hotel in Moalboal you can read Above. From 71$ per night – The Blue Orchid Resort, with rating of 8,3 points. From 158$ per night – Dolphin House Resort Moalboal, with rating of 8,1 points. The hotel on White Beach, which offers bungalows for rent. Dolphin House Moalboal organizes diving and snorkeling activities. Moalboal on Cebu island is convenient to stay, because you do not need to go anywhere for snorkeling and diving – just any time you want to go to the central street, then down to Panagsama Beach — and already 20 meters from the shore you can enjoy a colorful, so-called “home” coral reef. 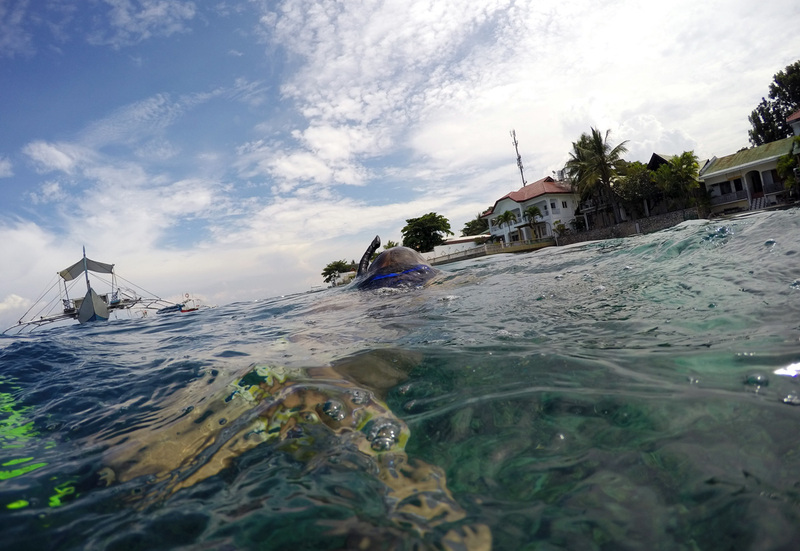 If the weather in Moalboal is good – you’ll have perfect snorkeling! You can rent snorkeling equipment in Moalboal in your hotel or in dive shops on the main street near Panagsama beach. The coral reef in Moalboal, Philippines surprises with its diversity and rich colors. Right near the shore when snorkeling you can easily meet turtles, try to catch up with them, and if you can – even touch them. 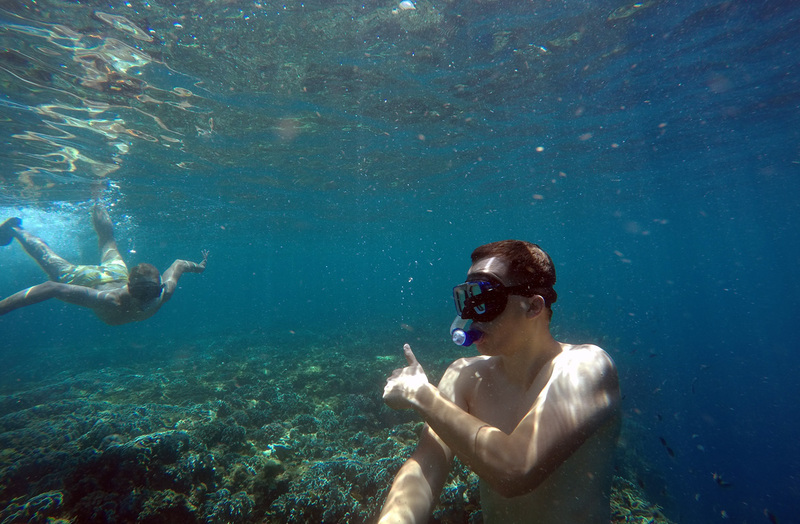 It is very convenient to snorkel in Moalboal – the reef is only 20 meters from the shore, so you can enjoy your favorite activity whenever you want. 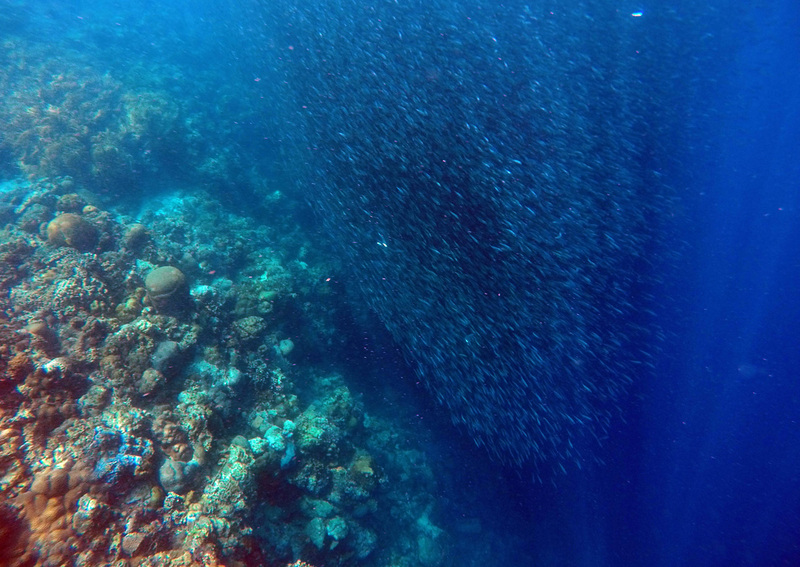 Another feature of snorkeling and diving in Moalboal in the Philippines are millions of sardines. This is what tourists from all over the world come to Moalboal for. Just imagine – you snorkel, viewing a colorful coral reef, then the reef breaks into a deep blue abyss, and in this place millions of sardines surround you. 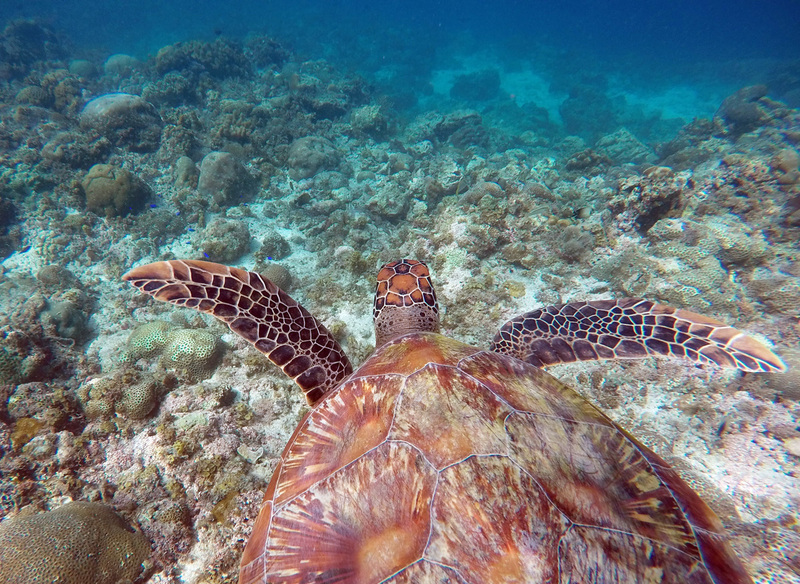 Unbelievable underwater images you can make when snorkeling in Moalboal. 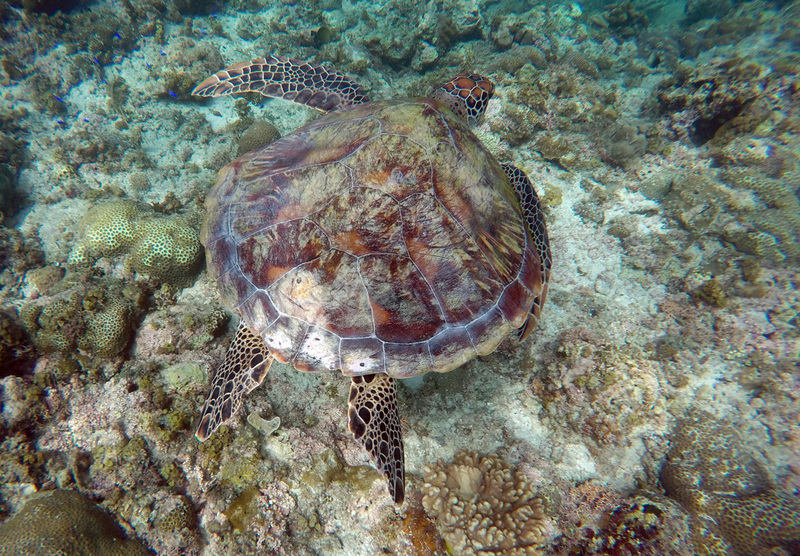 When snorkeling in Moalboal, Philippines you can sometimes feel discomfort. In some places, plankton on the water surface “bites”, because of what you can feel like a burning sensation, not very pleasant. The problem can be solved by changing the location, as the plankton is not everywhere. When snorkeling in Moalboal, you can also suffer from jellyfish. During snorkeling near Panagsama beach, I felt a burning sensation on my arm. Within just a couple of minutes, a rash appeared on it. 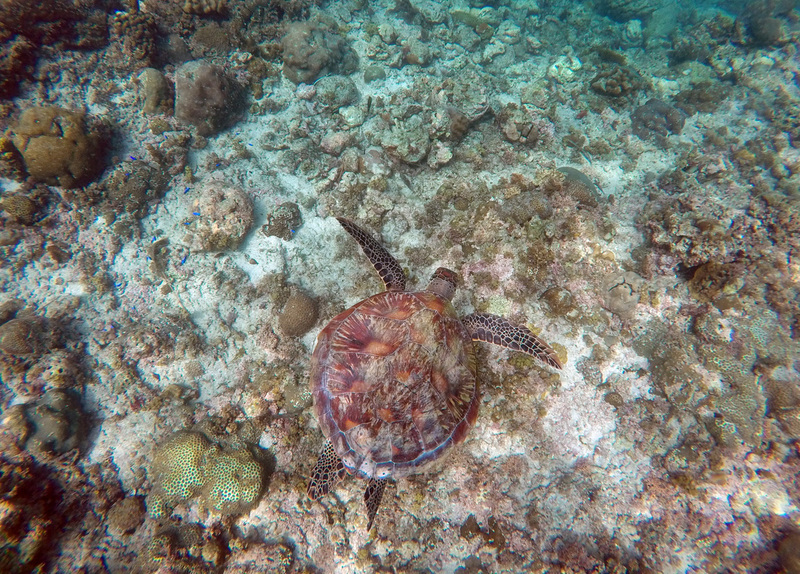 Snorkeling in Moalboal, Philippines is very exciting and interesting. Starting early in the morning, you can snorkel till 3-4 pm, and then dine in one of the cafes on the main street right near the beach of Panagsama. On the left hand from Panagsama beach you can see a small island – Pescador. Pescador island is one of the attractions of Moalboal, as there is one of the most beautiful places for snorkeling near the island. 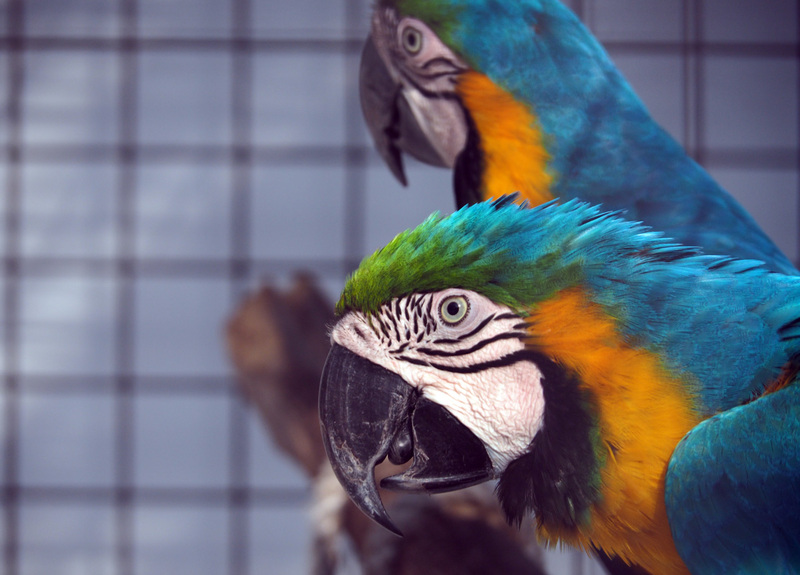 We went to Pescador island by the advice of the owner of the Parrot Resort, where we stayed. On the central street in Moalboal you can buy group tours, which combine activities in several places for snorkeling and island hopping. But we decided to rent a boat individually. The cost of island hopping boat rental for 3 hours for a trip from Moalboal to Pescador island and to the habitat of the turtles was 2000 PHP ($40). The rental price included only masks for snorkeling, so we also rented fins. 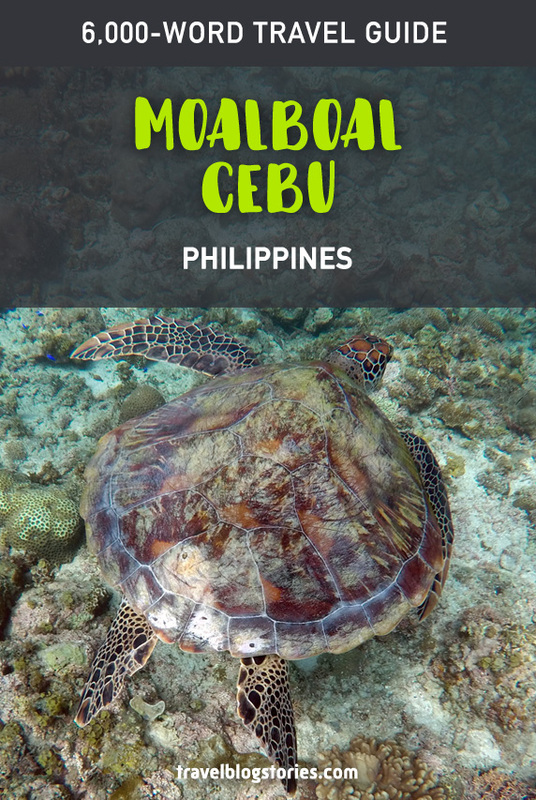 Even if you stay in one of the hotels in Cebu City or Mactan Island, you can easily get into the snorkeling paradise – Moalboal and Pescador Island. 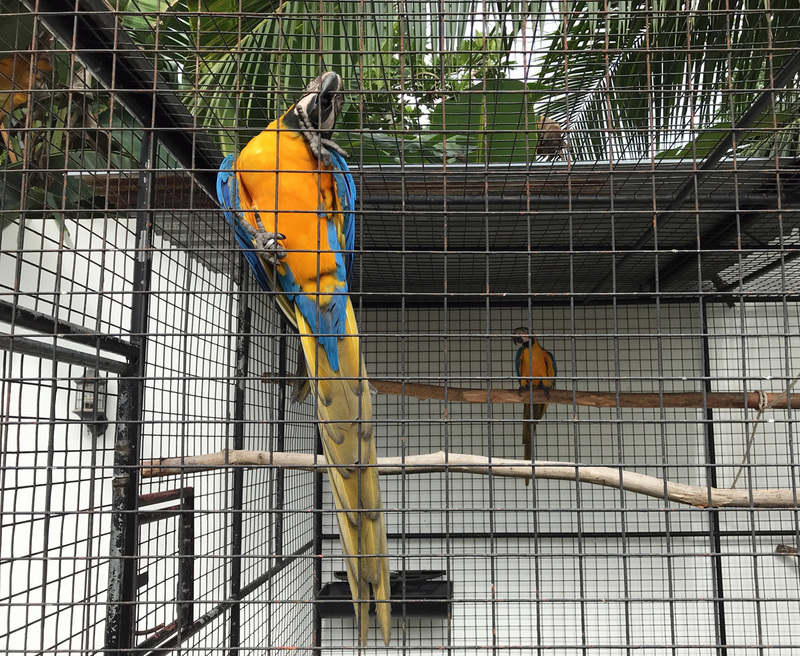 There is a one-day tour to Moalboal from Cebu City or Mactan — you are taken directly from the hotel and 2 hours later brought to Moalboal, then you go to Pescador island by boat. For a trip to White Beach in Moalboal we took a tricycle. The cost of one side trip around Moalboal from Panagsama Beach was only 150 PHP ($3) + a few additional entrance fees of 10-20 PHP per person along the way (something like a tourist fee). Every tourist should pay entrance fee on the way to White Beach in Moalboal, Philippines. After Panagsama beach, where it’s difficult to relax on the beach, we were pleasantly surprised that White Beach is really with fine white sand and you can have a good time on the beach. We arrived on White Beach at about 3pm at low tide and after a light snack went to snorkel. We had masks for snorkeling and coral shoes with us. It is better to take equipment with you, because we did not see where we could rent masks and fins on White Beach. 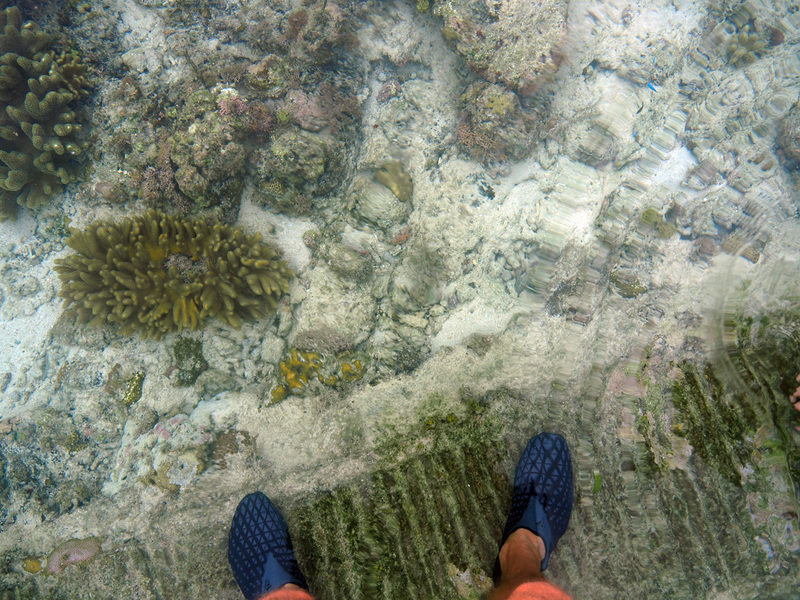 Coral shoes are necessary on White beach, there are a lot of sea urchins at the bottom, and the shoes will help to avoid troubles if you step on these marine inhabitants. 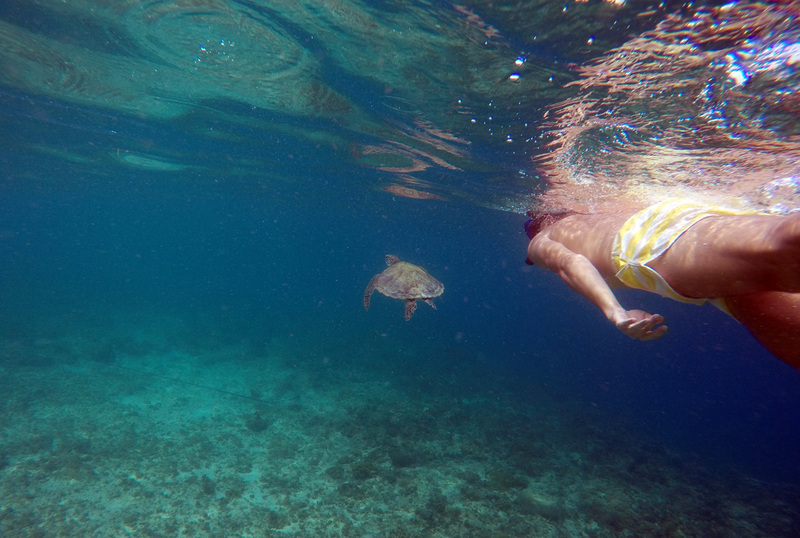 Snorkeling on White Beach is just great. Here you feel as if in an underwater fairy tale. At low tide on White Beach, you can even just walk around to see an interesting seabed. After snorkeling we decided to stay on White Beach to admire it during the sunset. Moalboal in the Philippines is a popular place among divers. Near the village there are about 25 dive sites, and on the central street near Panagsama beach – numerous dive schools, equipment rental and dive shops. 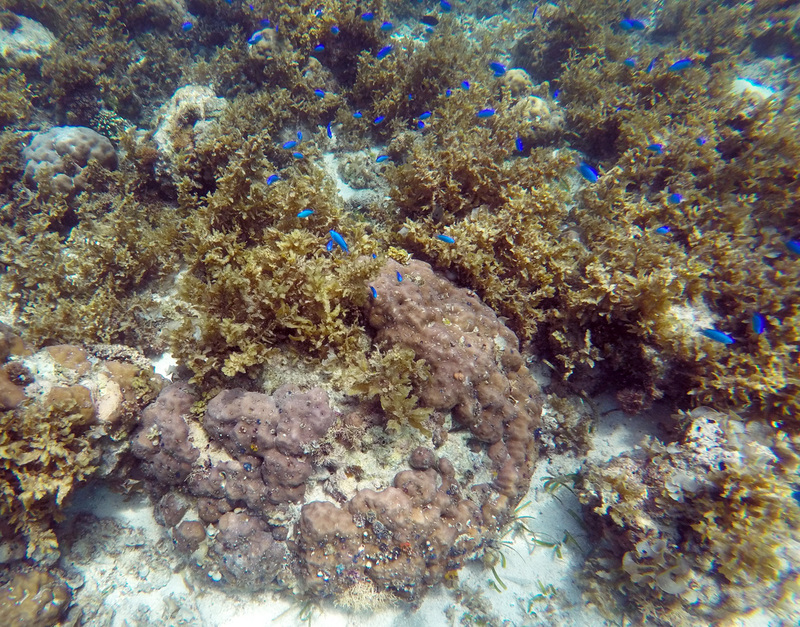 “Home” reef, which is right near the shore, provides divers with great opportunities to enjoy their favorite hobby. And this is why it’s a very busy place not only during the day, but also at night. Dives in the dark start after 6 pm. Savedra Dive Center — is one of the largest diving centers. 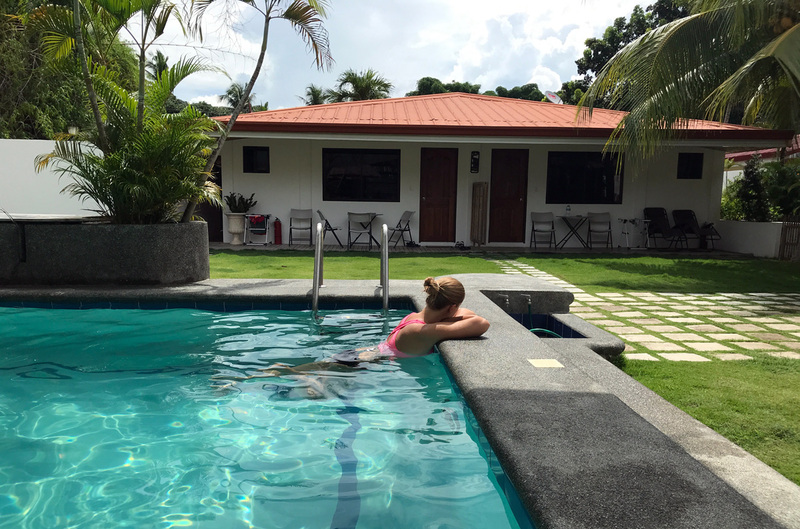 Here, in addition to dive services, for your convenience you can rent accommodation, in fact, many dive centers in Moalboal offer accommodation. There are instructors of diving and freediving speaking many languages in some dive centers in Moalboal on Cebu island. 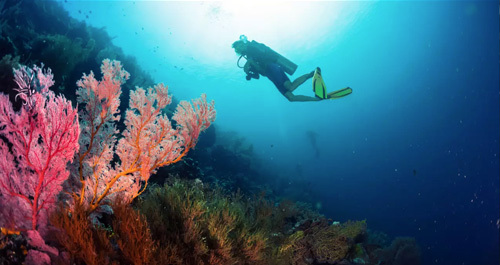 Of course, there are various training courses and programs in the diving centers of Moalboal, Philippines with the issuance of certificates and without them. In addition, tourists are offered a variety of excursions, combined with diving, where everyone will find something for himself. 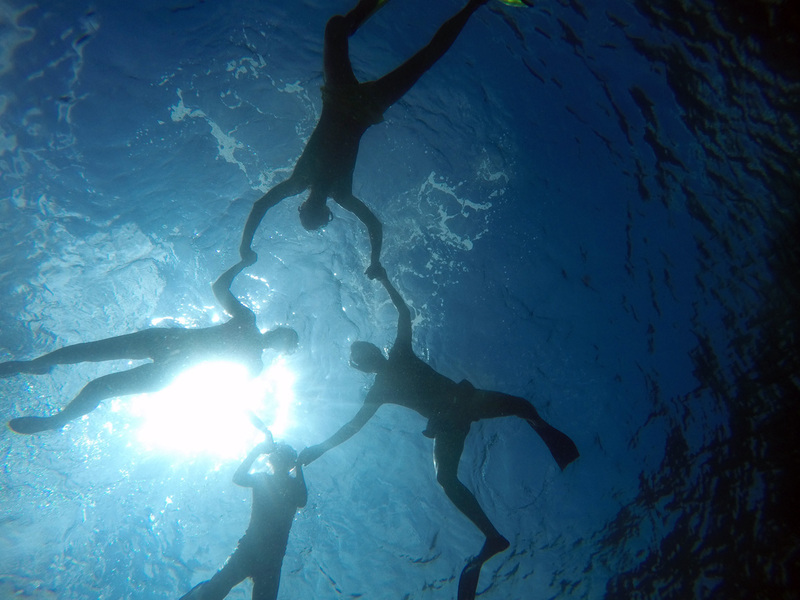 Freediving is an activity that is becoming more and more popular in Moalboal. This is facilitated by the ideal conditions of the underwater world in the area: a “home” coral reef that goes to a depth of more than 40 meters, as well as clear and calm water. 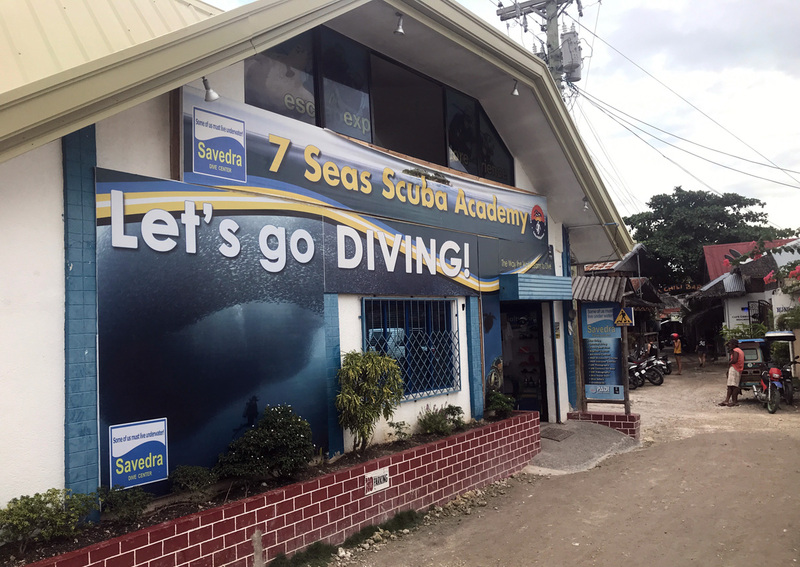 Dive schools in Moalboal, Philippines teach freediving. A two-day course for beginners costs about 10000 PHP ($200). 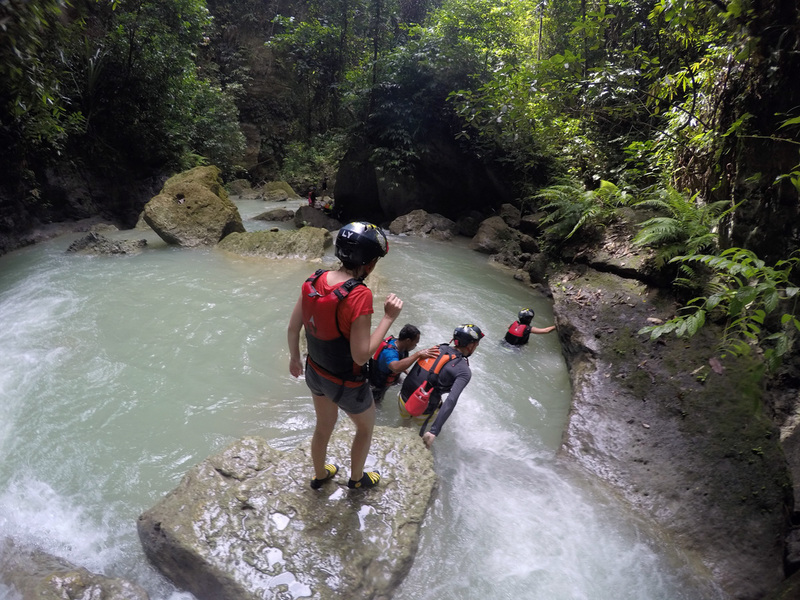 Canyoning or canyoneering — is a “walk” up and down the mountain river among the jungle, with jumps into the water from height, swimming, climbing the rocks and swimming on a raft under the Kawasan waterfall — one of the most interesting places on Cebu island. 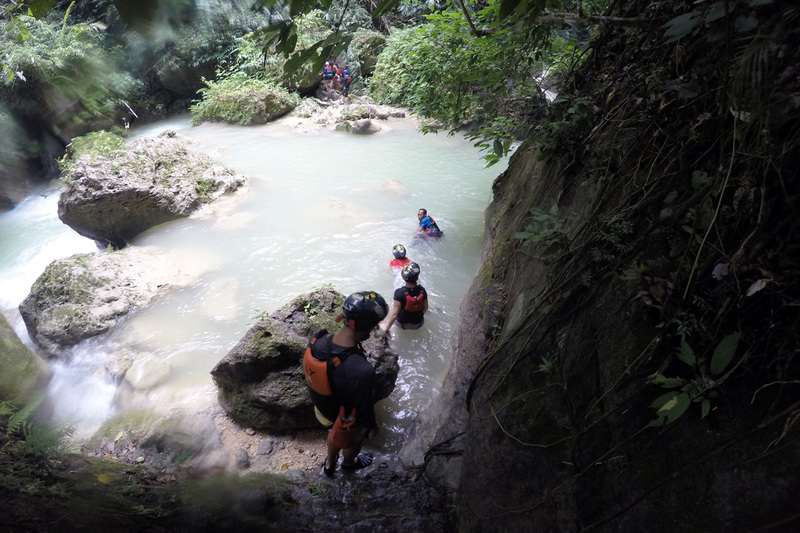 Canyoneering on Kawasan falls is one of the main attractions and activities from Moalboal. For canyoneering we took the whole day: the road to Kawasan from Moalboal in both directions and the canyoning itself took most of the day before the sun went down. 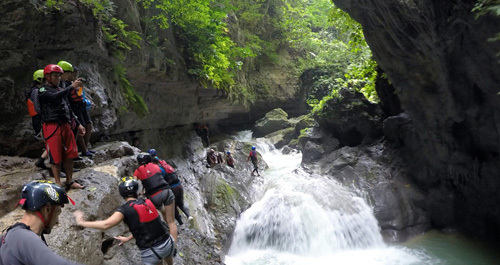 Canyoning on the Kawasan waterfall is an extremely popular entertainment on Cebu island, Philippines. It’s not a problem to buy a tour to Kawasan, you can do it in the excursions sales offices or in any hotel. In our hotel Parrot Resort Moalboal canyoning cost 2500 PHP ($50) per person (the price also included transfer and lunch). 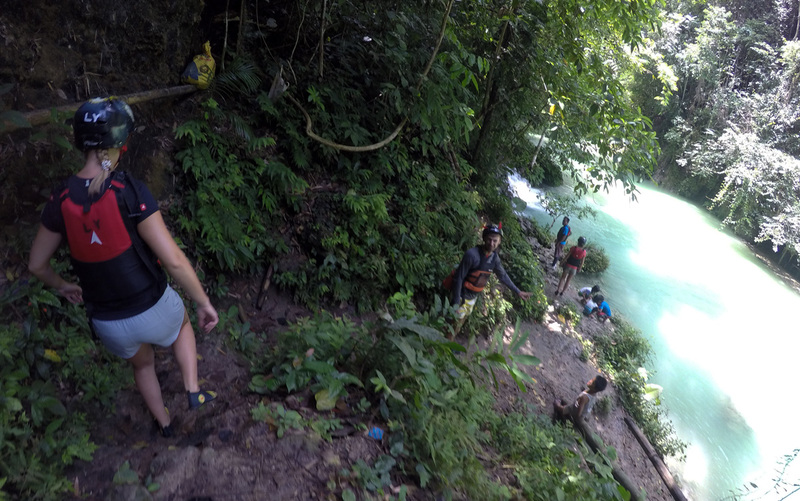 We went to the Kawasan waterfall by ourselves, using a simple Moalboal to Kawasan falls itinerary – by bus. 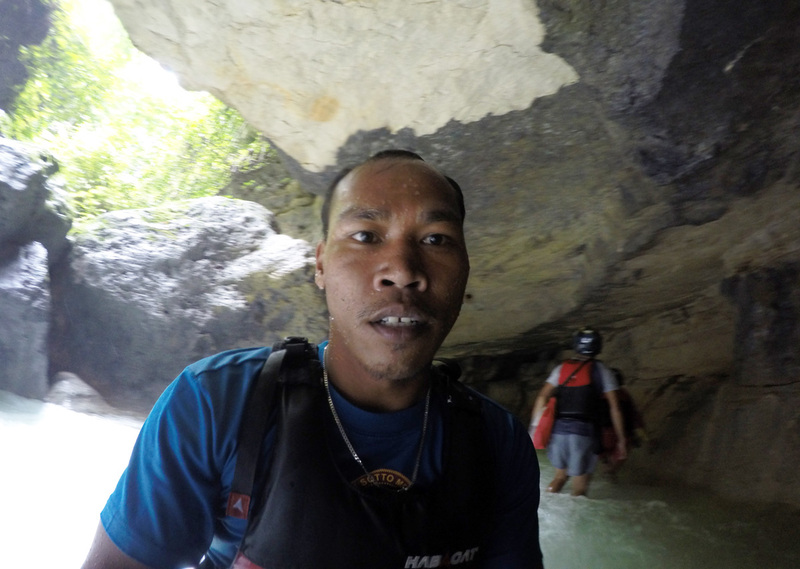 And in total with the cost of the bus from Moalboal and back, canyoneering cost us 1400 PHP ($28) per person. If your itinerary passes through Moalboal and you want to get to the Kawasan falls on Cebu island by your own, you need to take the passing bus from Moalboal to Badian. At the entrance to the bus you can ask the driver or conductor, whether you will get to Kawasan, you can also ask them where to leave the bus. The fare is cheap, I do not remember exactly, but something like 30 PHP in a bus without air conditioning and 50 PHP in air-conditioned bus. It will take only about 20 km. On the bus stop, tourists are immediately surrounded by locals who offer their services in organizing canyoneering on Kawasan, Philippines. 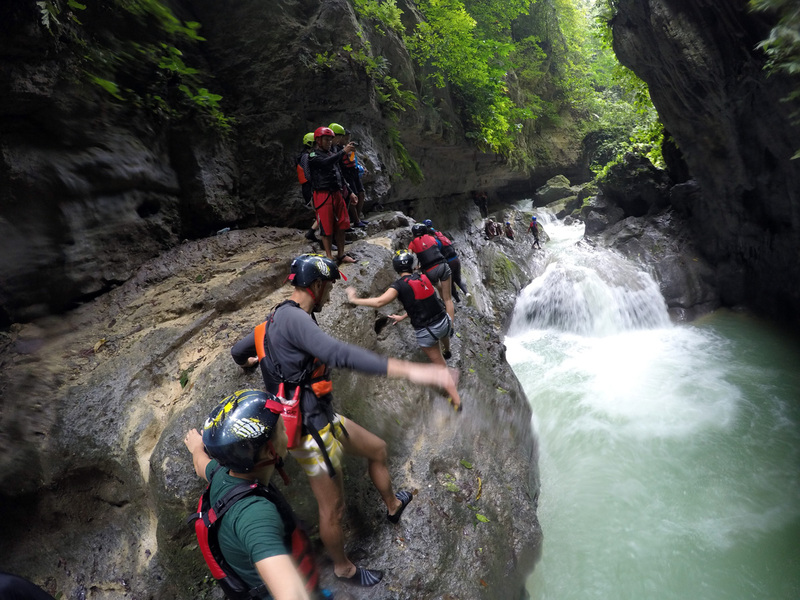 The fact is that there is no possibility to get to canyoning without a guide, but this is for the best for security reasons. We took a guide in the “office” just near the bus stop, the tour cost 1200 PHP ($24) per person, without lunch. What about clothes – we were in swimsuits and quickly drying sportswear, in coral shoes. I advise you to wear quickly drying clothes, as you will spend much time in water and in usual clothes it can be cold to be in, coral shoes or sneakers, which you are not afraid to swim in. To the start of the trip we were taken by motorcycles, we went by our company of 4 people with a guide. And already at the very beginning we experienced the thrill – the first jump into the water was from a height of 8 meters. 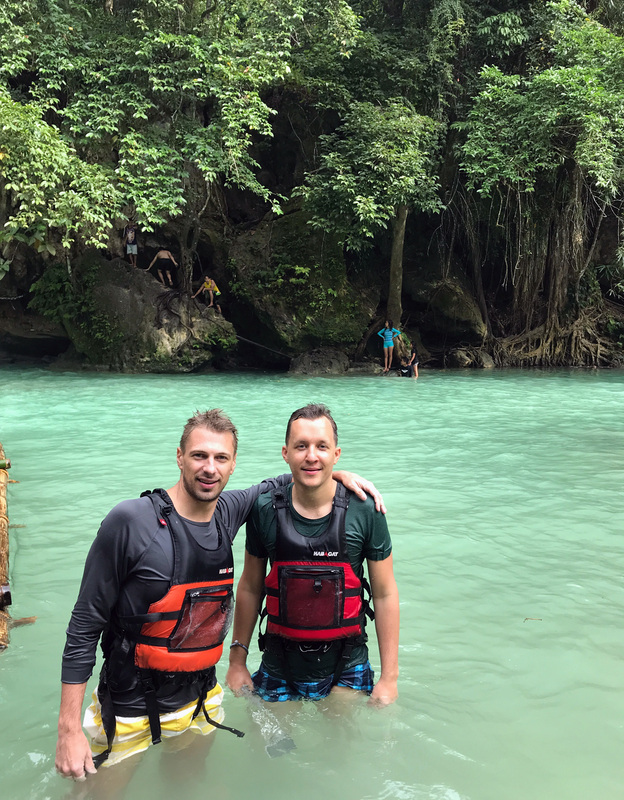 It was certainly possible to go down to the river on foot, but we decided to feel all the delights of canyoneering on Kawasan falls. We didn’t make stops during the route on Kawasan, exceptions were to take photos or forced stops with the queue with lots of other tourists (jump into the water along the waterfall or rise between the rocks). Also there was one more stop – in a place where tourists have lunch. We took a tour on Kawasan without lunch and did not regret – the tourists were offered roasted sausages – what looked not so tasty. And already quite tired, we decided to just sit and relax. 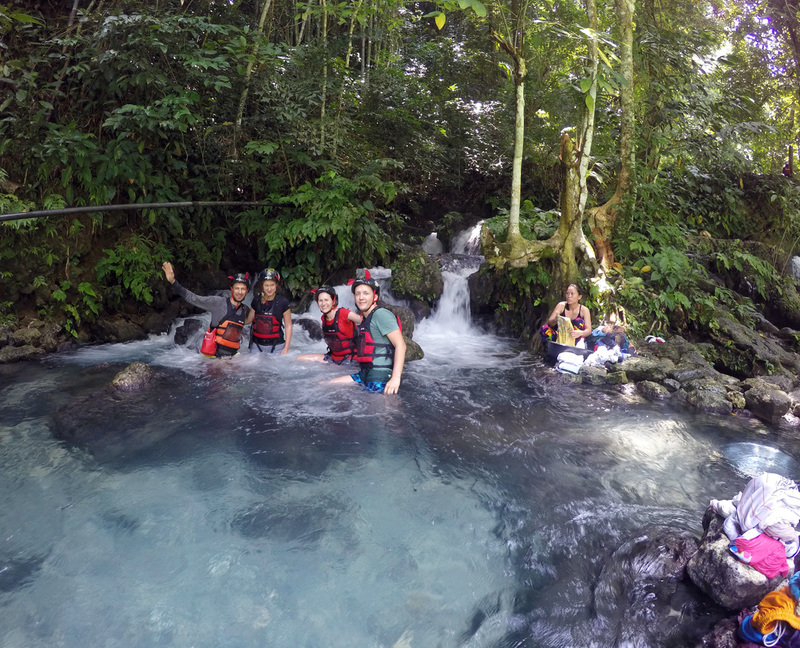 At the end of the route, it would seem that you can relax – but you will have an opportunity to make several more high jumps into the water on the Kawasan waterfalls. And you can rent a raft to swim directly to the Kawasan. There is also a cafe where you can have a snack. 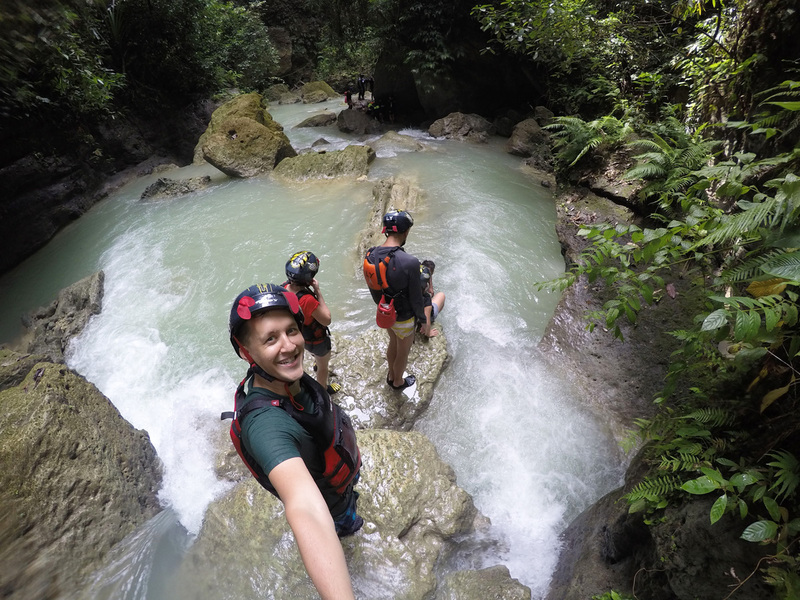 Is canyoneering on the Kawasan waterfall on Cebu island worth visiting? 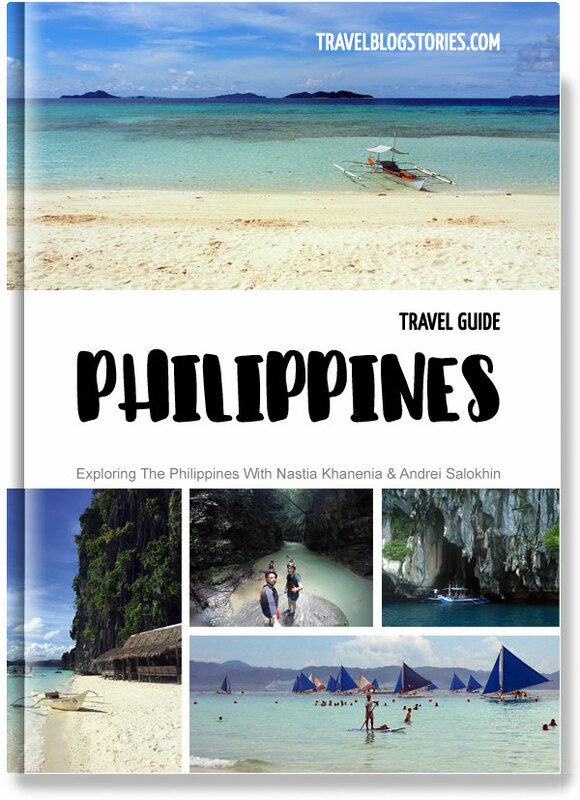 Definitely yes, if you are active and want to make your vacation time during a trip to the Philippines more interesting. Do not forget to take the appropriate clothes and shoes in which you can swim with you, and pleasant impressions are guaranteed to you! 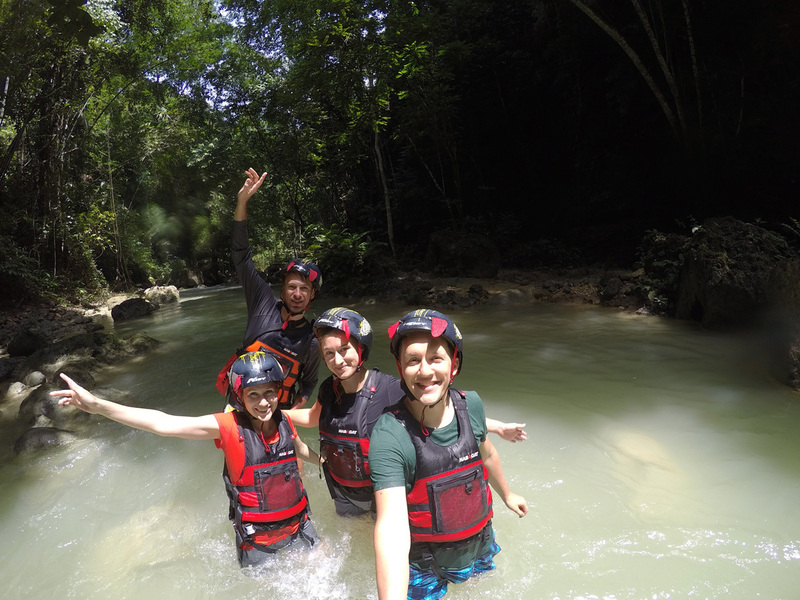 We all really liked it and recommend canyoneering on Kawasan to everyone! If you stay in Cebu City or on Mactan island – you can get to the Kawasan waterfall during a one-day trip, which includes canyoning on the Kawasan waterfall and visiting the Peak of Osmen. This is convenient, because you do not have to worry about anything – you are taken from the hotel in the morning and by the evening brought back. One of the most famous holiday features in the Philippines is the opportunity to swim side by side with whale sharks on Cebu island. For this, thrill-seekers from all over the world gather in the morning in the village of Tan-Avan near Oslob on Cebu island. In the mornings – because swimming with sharks is only available from 6 to 12 o’clock in the morning, this is the time when the sharks are feeded near the shore, and tourists have the opportunity to swim with these marine inhabitants. Despite their impressive size, and adults reach 12-18 meters in length, whale sharks are not dangerous to humans. That’s all because whale sharks is one of the species of sharks that eat plankton, they do not pay any attention to divers and people who are simply nearby. Nevertheless, the impression of swimming with this size of fish will provide vivid emotions (perhaps not in Oslob, but about this below). For Filipinos prices are 2 times lower, for example, watching sharks from a boat costs only 300 PHP ($ 6), while swimming with sharks costs 500 PHP ($10). If your choice is watching sharks – you just stay in a boat and watch how the staff feed sharks. Swimming with sharks in Oslob, Philippines means diving from the boat and maneuvering for 30 minutes among sharks, and in fact – among the numerous tourists and boats. The snorkeling mask is included in the price, fins can be rented for 100 PHP ($2). Whatever you choose, it starts all the same. If you come to Oslob by yourself – you should buy the ticket and listen to a lecture on safety and behavior rules with sharks. Then change your clothes, and you will be taken by boat about a hundred meters from the shore, to the place where sharks stay. Time of staying in water is 30 minutes. The rule №1 is “do not touch the sharks”! In fact, swimming with sharks on the island of Cebu is a swim in a small area, among a large number of tourists and boats. We thought a lot about the humanity of this kind of leisure and the condition of sharks. And it was the main reason not to go to swim with sharks in Oslob on Cebu island, Philippines. You should go to Tan-Awan village, which is 10 km away from Oslob. Everyone on Cebu island knows where this place is. Therefore, if you have any questions or doubts on the way – ask the driver or conductor of the bus, saying that you are going to swim with sharks. To Oslob from Bohol island: first take a ferry from Tagbilaran to the port of Cebu on Cebu island, and then from the South Bus Station of Cebu City by bus to the south via Oslob. To Oslob from Alona beach, Panglao island: directly to Tan-Awan to sharks on one of the numerous boats. Information on this can be found on the beach of Alona, the journey takes about 4 hours, the cost is about 1500 PHP ($30) per person. For swimming with sharks in Oslob there are also organized tours, if you buy a tour, you do not have to worry about how to get to Oslob, the transfer is already included into the price. The prices are per 1 person. Swimming with sharks in Oslob tour — You are taken from the hotel, 3 hours you spend in a picturesque road to the south of Cebu island, after you swim and snorkel with sharks, on the way back there is an opportunity to visit another attraction of Cebu island – Tumalog waterfall. 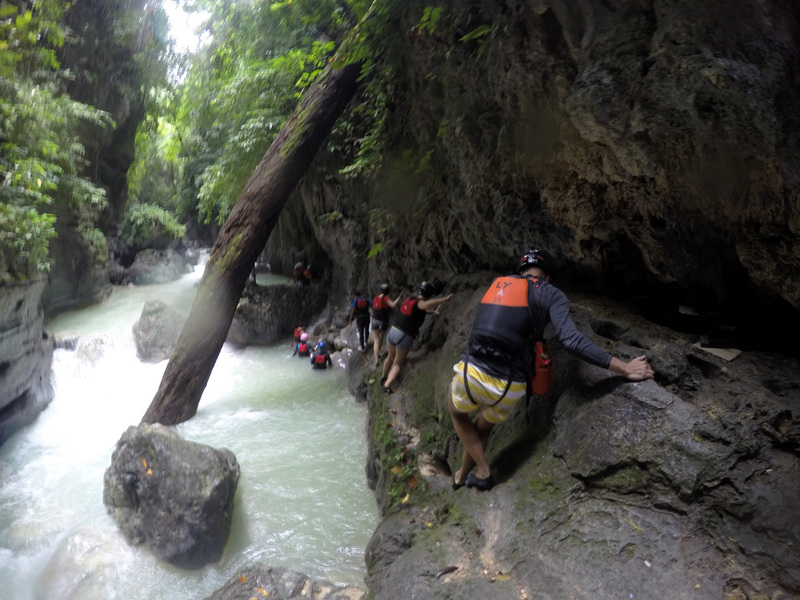 You can combine swimming with sharks in Oslob and canyoneering on the Kawasan waterfall. In this case, you will get so many emotions that you will definitely remember this day on the island of Cebu, Philippines for a long time. 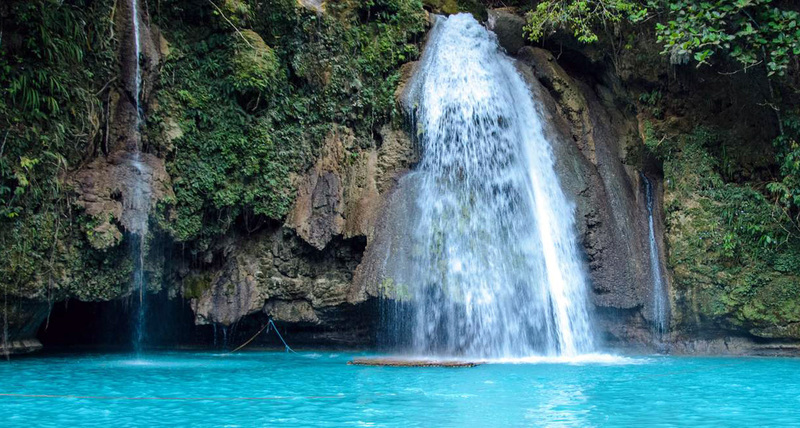 Swimming with sharks in Oslob and canyoneering on the Kawasan waterfall tour — You are taken from the hotel, 3 hours you spend in a picturesque road to the south of the island, after swimming and snorkeling with sharks you visit Tumalog waterfall. 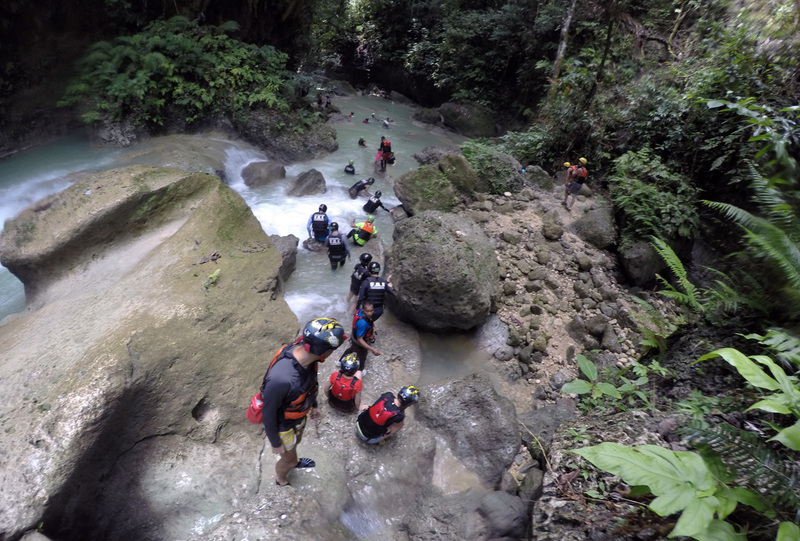 Then you are taken on a fascinating journey – canyoneering on Kawasan waterfall, where you jump, swim, climb up the picturesque rocks of Badian along the mountain river. 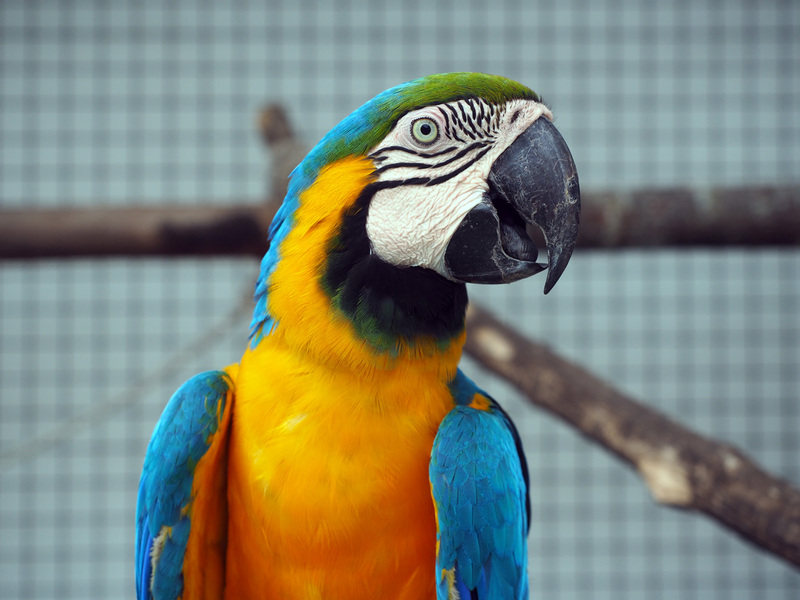 Get to Sumilon island without staying in the hotel, you can also get a one-day tour from Cebu City or Mactan. 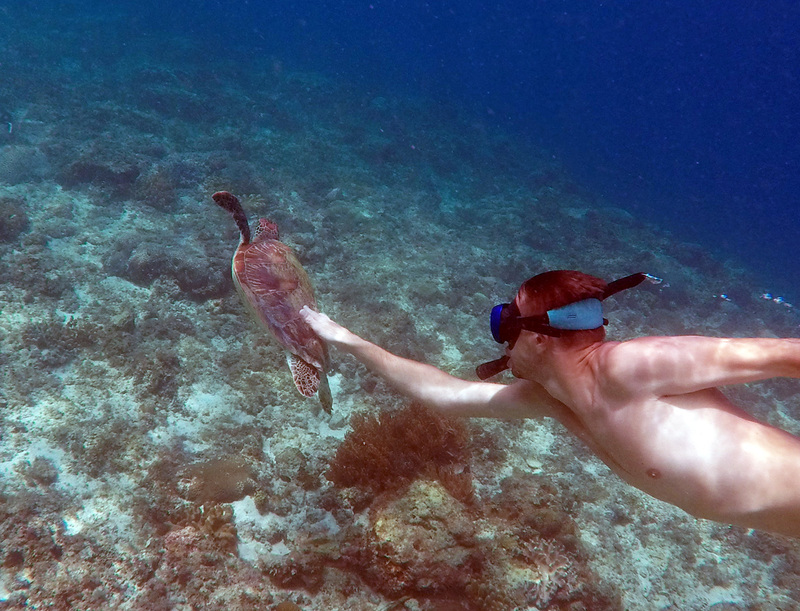 This tour is an opportunity to spend a day on a paradise beach with an amazing snorkeling. From $20 per night – The Biggies Inn, with rating of 8,4 points. A simple option in Tan-Awan for tourists, close to the place where you swim with sharks. From $35 per night – Susada’s Inn, with rating of 9,1 points. The hotel is located right in Tan-Awan village, very close to the beach where the sharks are, which is its undisputed advantage. From $50 per night – Down South 118 Beach Resort, with rating of 8,2 points. A good hotel to spend a couple of days. 5 minutes on a tricycle to the town, while to the place of swimming with sharks is 20 minutes to go. From $247 per night – Sumilon Bluewater Island Resort, with rating of 8,3 points. A four-star resort Sumilon Bluewater is the only one on the island. The hotel owns the area of 24 hectares. From the hotel you can directly access the beaches with coral reefs. 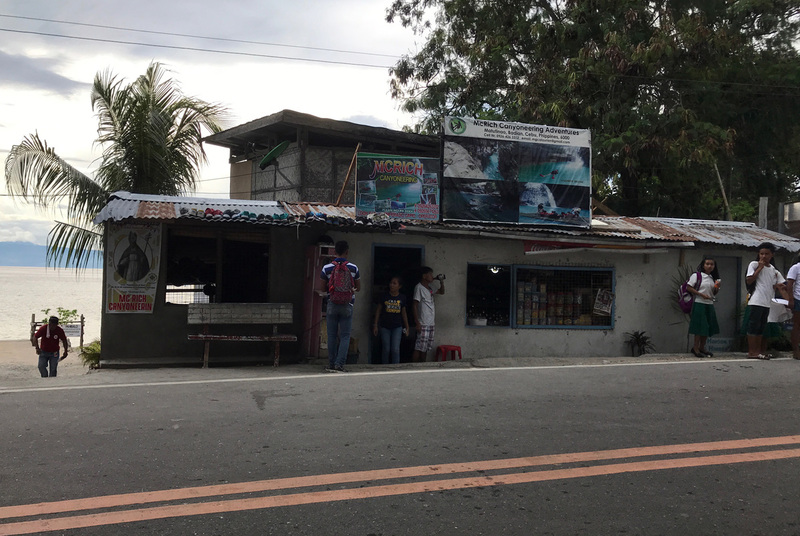 The market is not in the tourist area, but directly in Moalboal village near the highway leading to the west of the island. If you live near Panagsama beach and especially near White Beach – to get to the market you need to take a tricycle to Moalboal. The market in Moalboal on Cebu island is much larger than the markets we visited earlier in Coron Town on Busuanga and El Nido on Palawan. The market differs with a wide choice of the goods and products, here besides vegetables and fruits, meat and fish, it is possible to buy also cereals, pastries, etc. What is noteworthy – cereals are sold from large bags by weight. At the entrance to the market there is a large pharmacy, there are also several small pharmacies nearby. This place is not made exclusive for tourists, mostly locals visit it. Across the road closer to the supermarket there is a separate fruit market in Moalboal. When we just arrived in Moalboal and wanted to buy fruit early in the morning, before we went to the hotel, we stopped at the fruit market, because it was closer. If your goal is only fruit, then there is no need to go to the big market of Moalboal, you can buy everything on the fruit market. Supermarket in Moalboal is located next to McDonald’s in Gaisano Grand Mall. The second floor of the shopping center is for non-food items, and honestly there is nothing to do, apart from one thing – we bought coral shoes there. Before going to canyoneering on Kawasan falls we went for coral shoes to Gaisano Grand Mall. There were some discounts in the shopping center, and for coral shoes too. Later it turned out that the same coral shoes were sold on the main street near Panagsama beach, but 2 times more expensive. Shopping Center Gaisano Grand Mall for the first time we visited the morning directly at the beginning of its work. And the daily opening ceremony of supermarkets in the Philippines at that time we saw for the first time, which a bit surprised us. The visitors began to gather outside 15 minutes before the opening of the shopping center, while all the security officers gathered inside (there are a lot of security officers in the malls in the Philippines). And exactly at 9 am the doors were opened but visitors were allowed to enter only after the hymn being sung by the security officers. On the first floor of the shopping center there is a supermarket and small shops where you can buy coffee / cakes / fruit smoothies. The supermarket in Moalboal is large, there is everything you need, quite a wide selection of products. That’s where we bought the delicious dried mango 7D for the first time. 7D Cebu mangoes in packs are sold everywhere, but in Manila, for example, it is slightly more expensive than on Cebu island. 7D dried mangoes is a good choice to bring to your friends as a souvenirs from Philippines. On the main street near Panagsama beach a large number of restaurants for any taste is concentrated. There are super-cheap cafes for locals and good cafes, owned by Europeans in Moalboal, Philippines. The second most rated on Tripadvisor cafe in Moalboal. This was the first place we went to eat after we arrived in Moalboal, and we liked it so much that we ate here every day. The only disadvantage of the cafe in our opinion is too slow service, and if the cafe had a sea view – awaiting would have been much easier. What about cuisine – everything was fine, everything we ordered was very tasty, the portions were large. 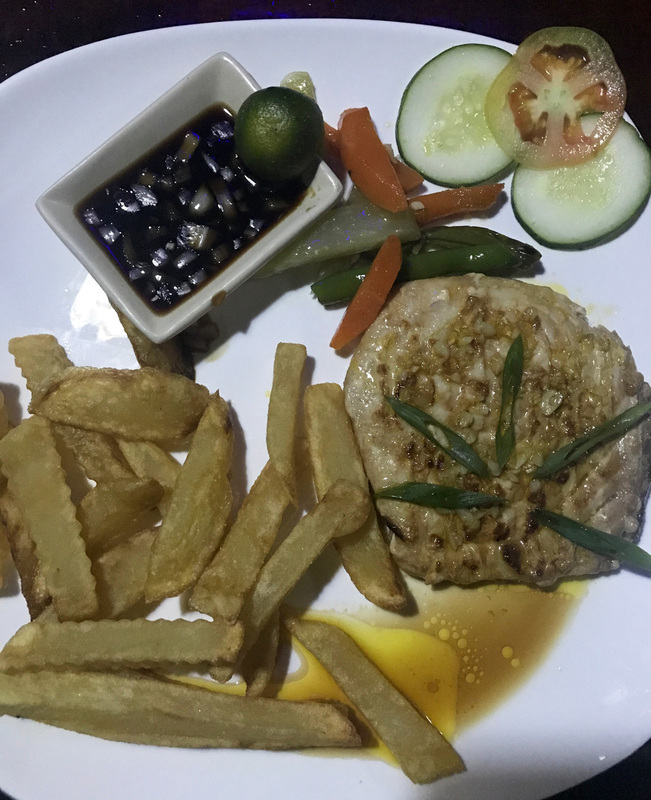 Prices at The Pleasure Principle Resto-Bar are slightly higher than the average in Moalboal, but it’s worth it. There were always a lot of visitors, and most of the time the owner also was sitting there, a nice man who always comes up to talk and find out whether you are satisfied. 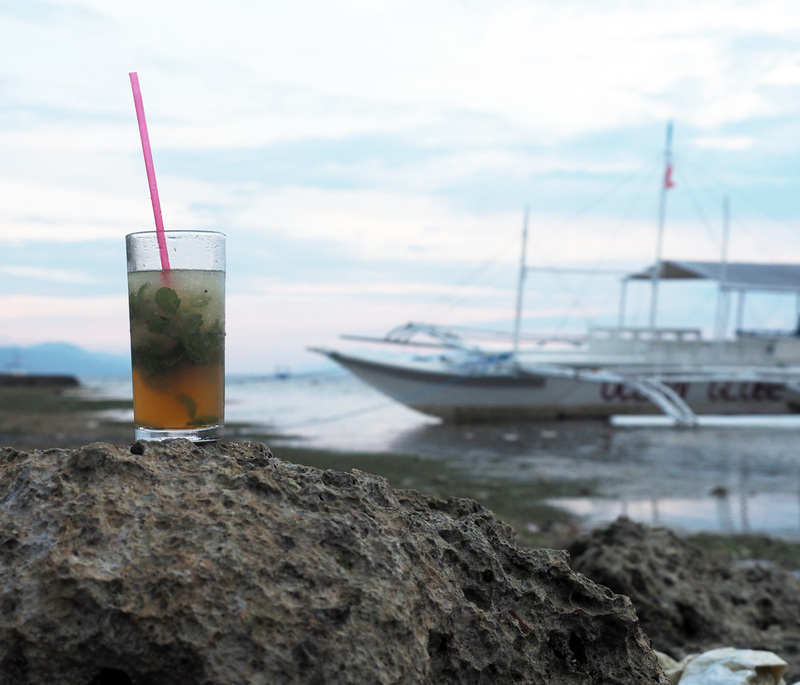 Visit The Pleasure Principle Resto-Bar in Moalboal – and you will surely stay pleasantly surprised and satisfied! Cafe with a sea view, which attracts your attention at once. But we liked the cuisine also. 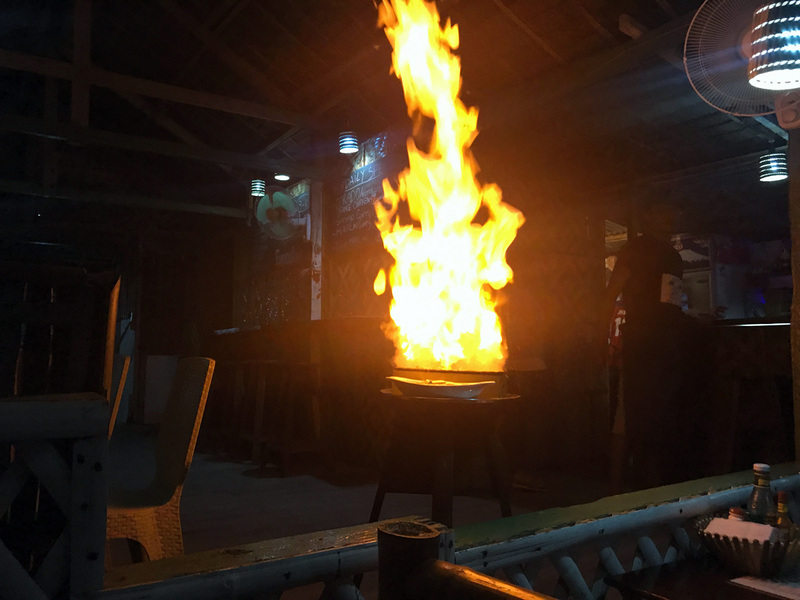 A special feature of this place is the “burning” food, which is finally set on fire in front of you. In Cockonuts we liked fish steaks most of all and especially from blue marlin. We could close our eyes on the severely broken edges of the dishes, if the food was delicious, but no, we didn’t like the food too. Each of us ordered a different type of breakfast in The French Coffee Shop, and nobody liked it. It was also unpleasant that even the drinks were not tasty – fruit smoothies were too diluted with water and were much worse than smoothies for example from The Pleasure Principle or Cockonuts. 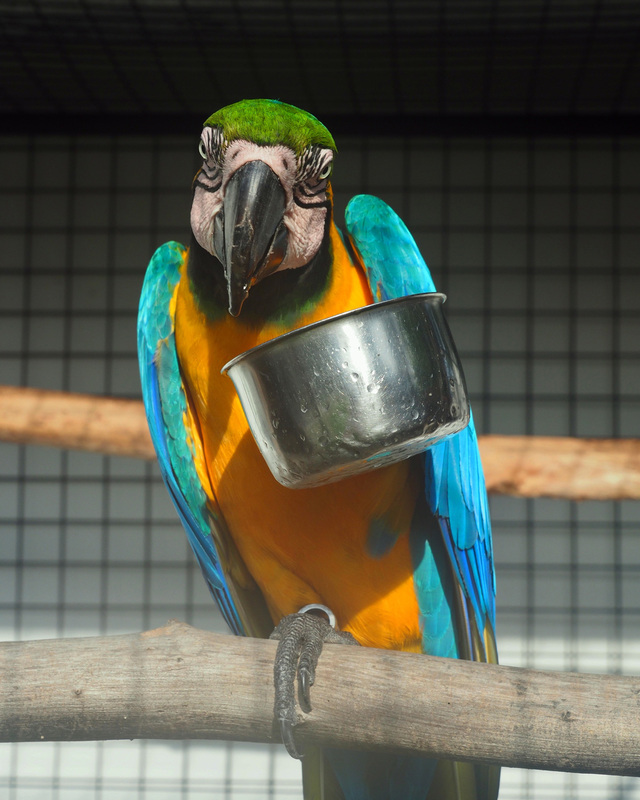 The result of visiting The French Coffee Shop was the only one – we’d better stayed to have breakfast in our hotel Parrot Resort, where the breakfasts were excellent. Cafe with a wonderful sea view, I advise you to reserve a table for the sunset in Moalboal – and you will remember this evening for a long time, the view is simply magnificent. The cuisine was not exactly to our taste, here we drank coffee and smoothies, and then went to have dinner in another place. 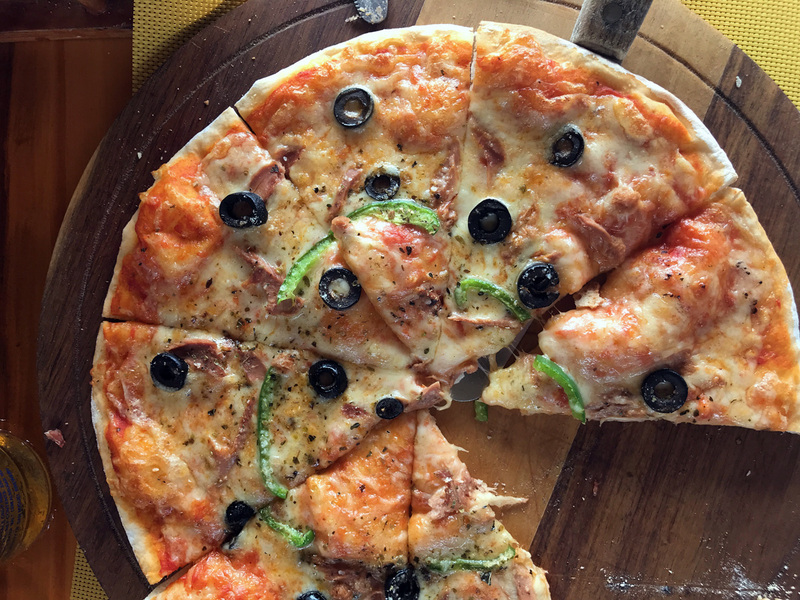 The specialty in Chili Bar is pizza with mango and tuna (we didn’t like it at all). Although this is a place with a good rating and it is famous for pizza, maybe we certainly were not lucky, but all 4 pizzas that we ordered were not very good. In the evening Chili Bar is one of the few party places with loud music, where you can also play billiards. We were happy that we included Moalboal on Cebu island in our itinerary round the Philippines. 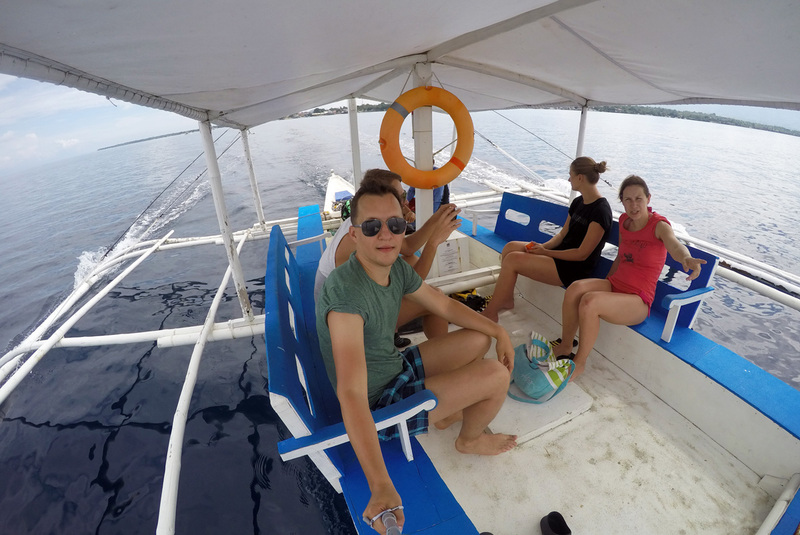 In Moalboal we got absolutely different experience from vacation in the Philippines – after daily boat tours to the lagoons, white beaches and palm groves of El Nido and Coron, we were pleased to change the atmosphere and spend days in diving atmosphere. There are no random tourists or fans of an exceptionally lazy beach time in Moalboal, Philippines — everyone who travels here is fond of either snorkeling or diving / freediving. Moalboal is rich in adventures, you will never get bored here! 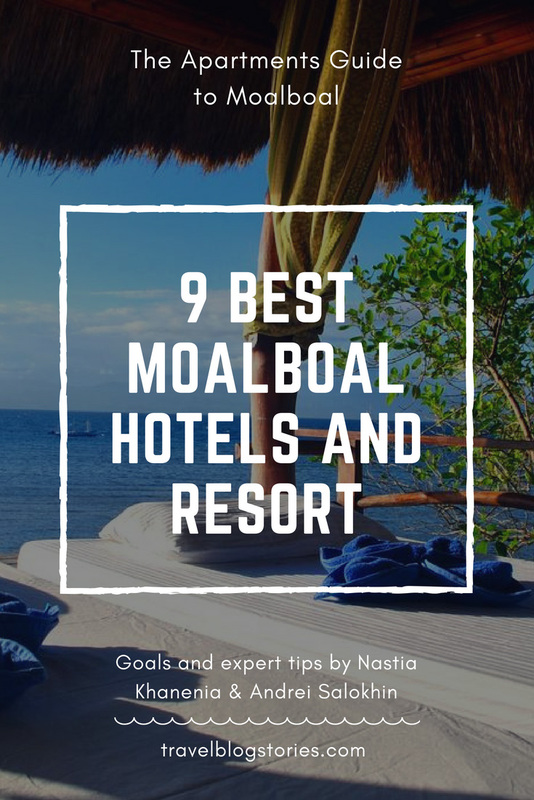 Moalboal is perfect due to the fact there’s no need to go anywhere by boat, you come to Panagsama beach or White Beach – and you can endlessly snorkel at the colorful “home” reef. In Moalboal you can swim not only with turtles, but also among multimillion sardines, enjoying the beauty of the colorful underwater world. Moalboal – is a resort with a dive spirit. 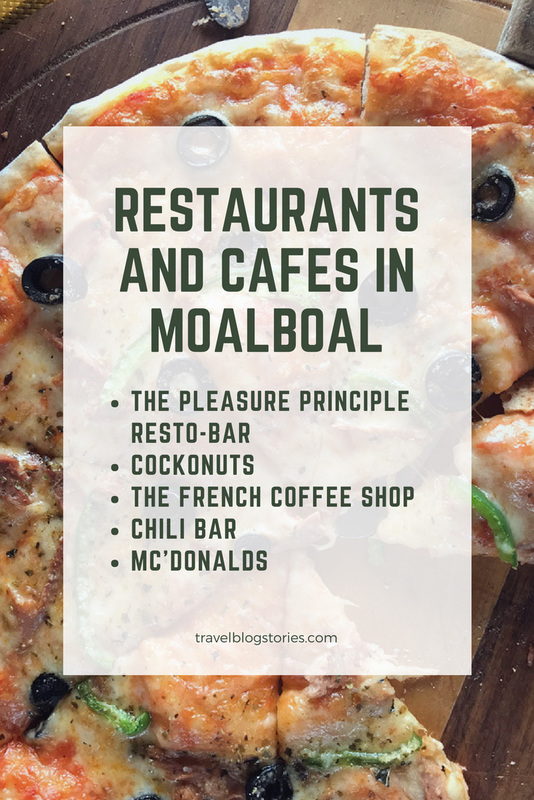 Here tourists get up and go to bed early, and there is practically no nightlife in Moalboal, only a few cafes can hang out late. From Moalboal it is convenient to go to the Kawasan waterfall. 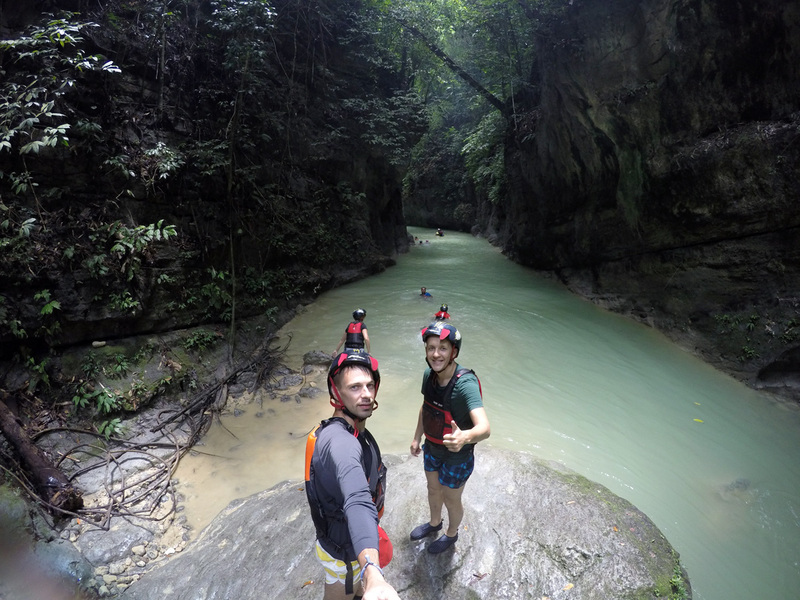 For a trip to canyoneering on a waterfall it is better to take the whole day — those who like activities will be delighted! 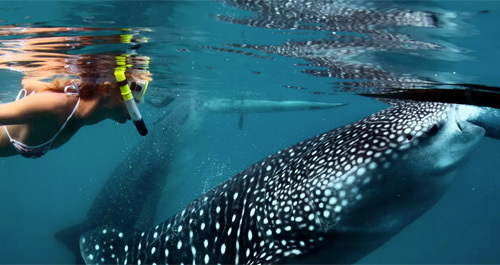 Swimming with whale sharks in Oslob is another popular destination on Cebu island for tourists from all over the world. From Moalboal to Oslob you can get both by yourself and as a part of a group tour. Be sure to include Moalboal on Cebu island in your itinerary round the Philippines, if you like snorkeling or diving. 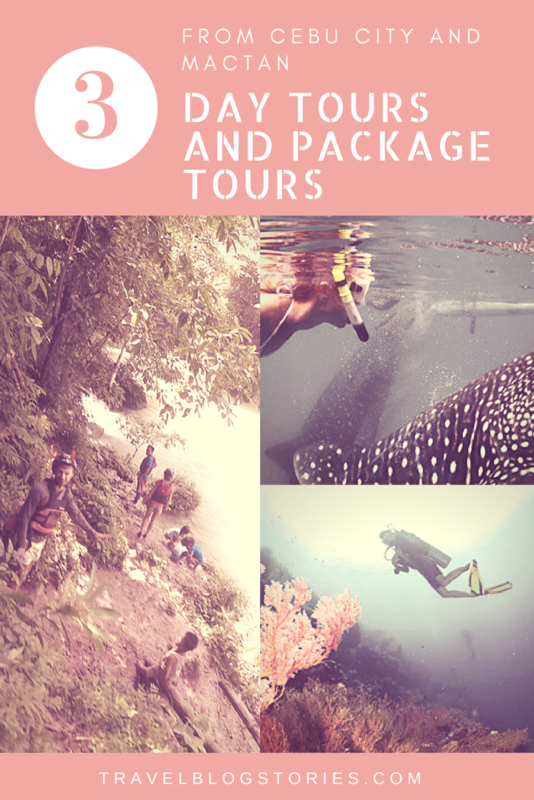 It will not only make your vacation more interesting, but will also bring an incredible amount of pleasant emotions and memories about the adventures in Moalboal. The underwater world will surprise even the most sophisticated travelers, after all Moalboal, Philippines is a popular resort among divers, which attracts fans of the underwater world from many countries.